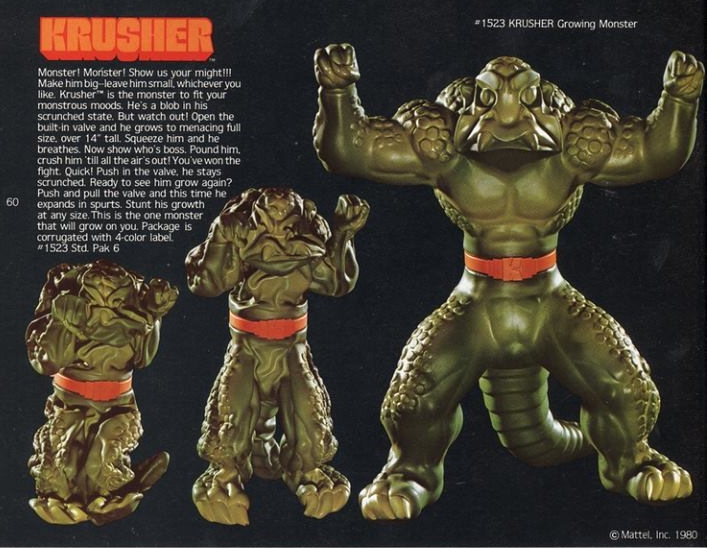 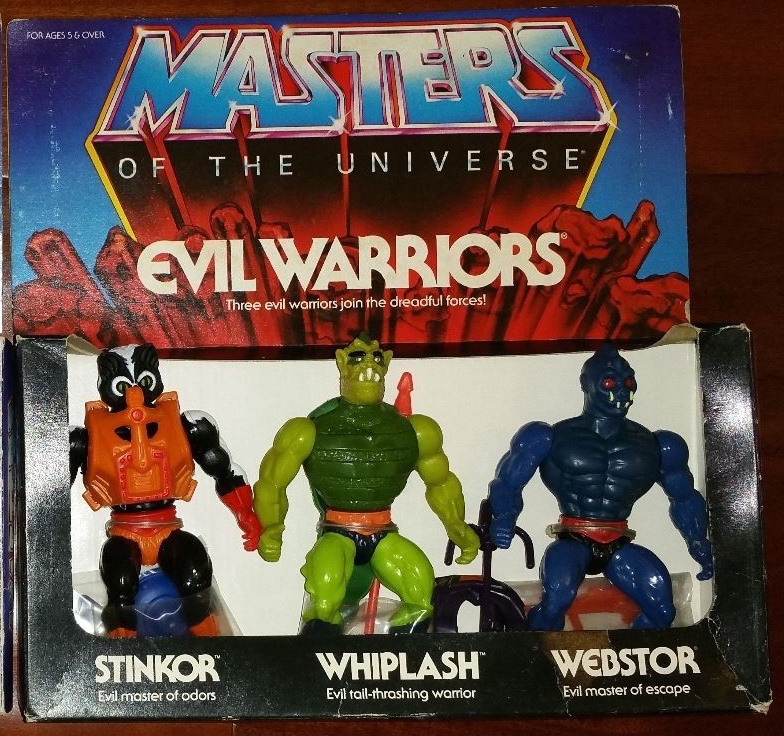 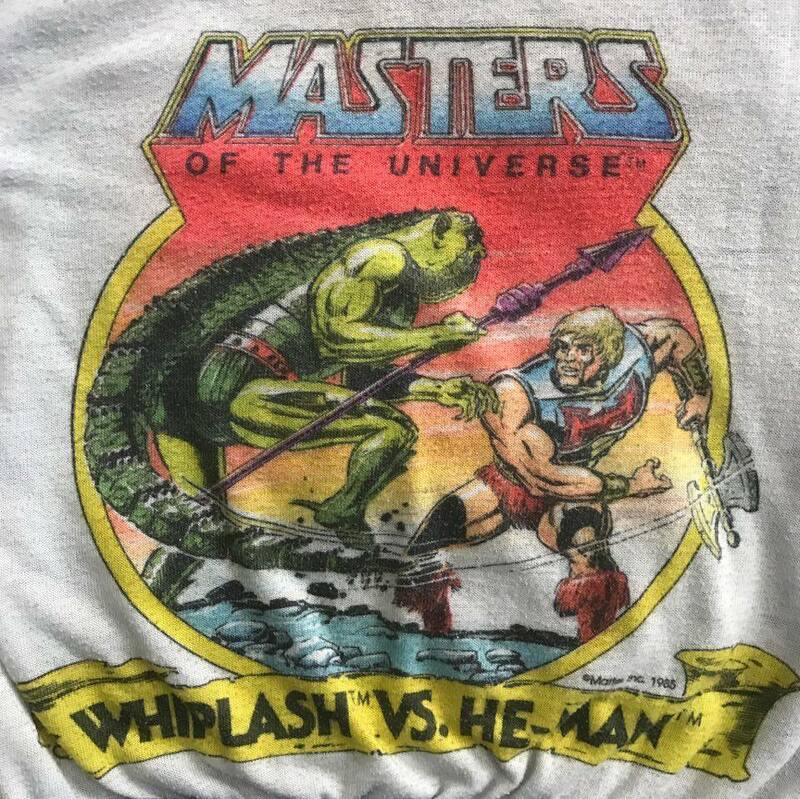 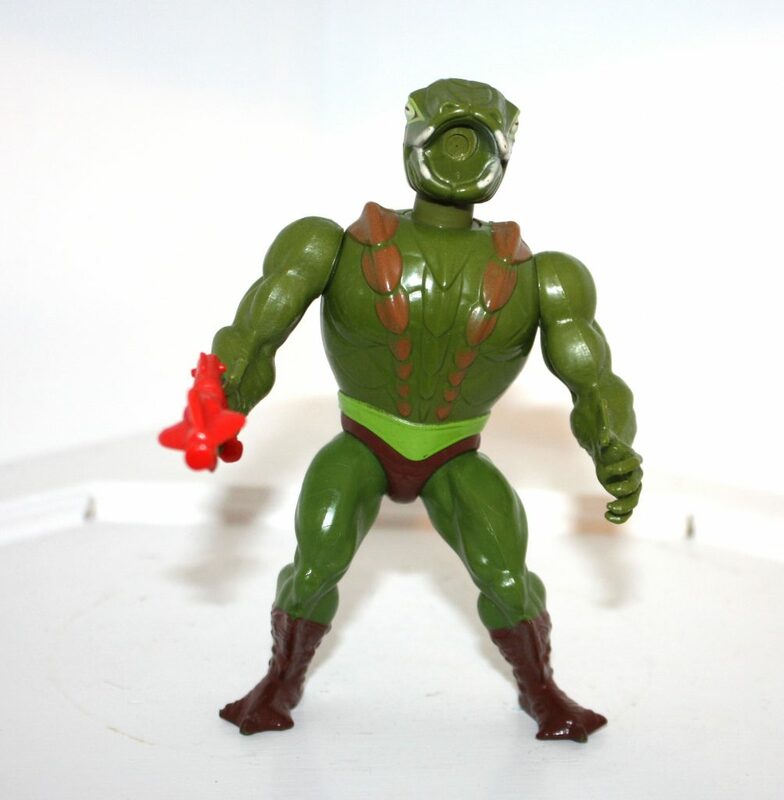 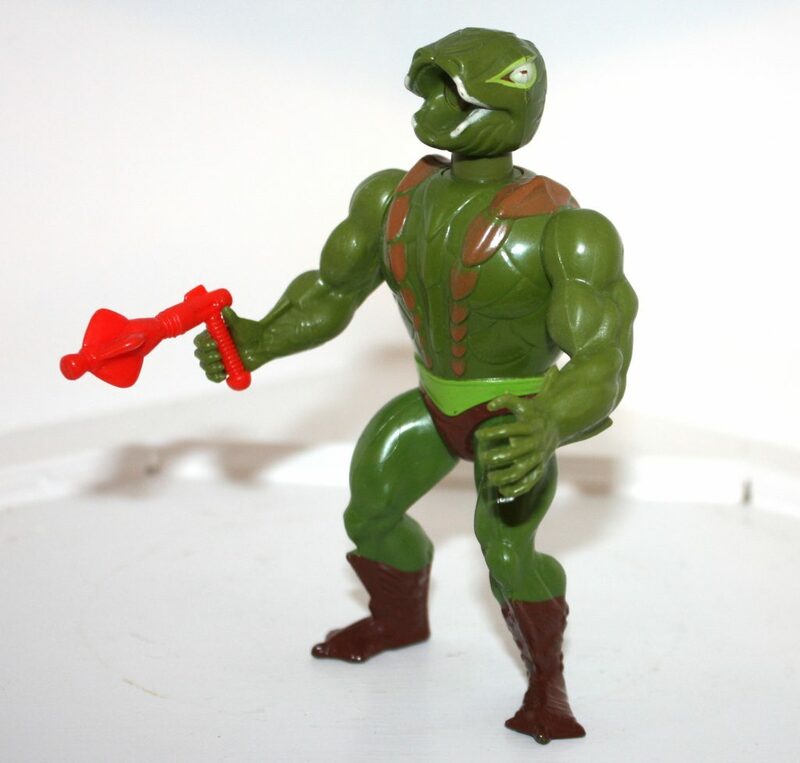 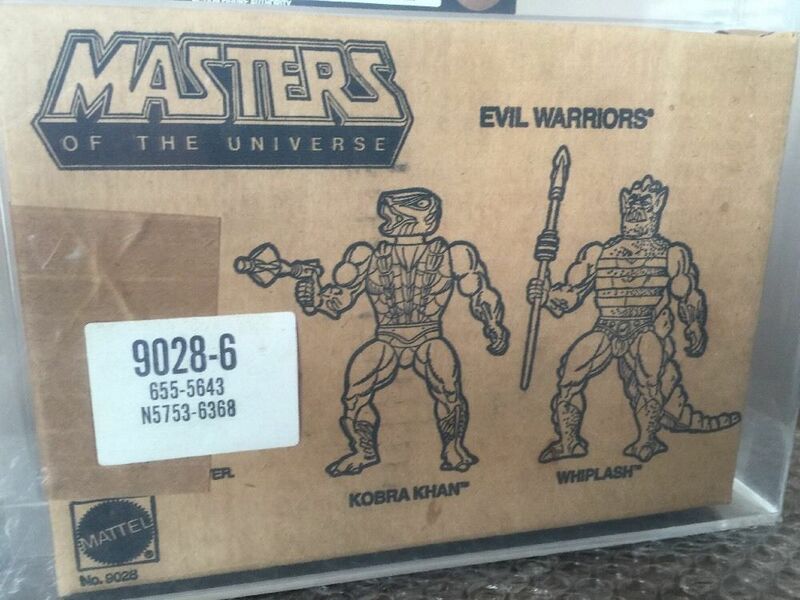 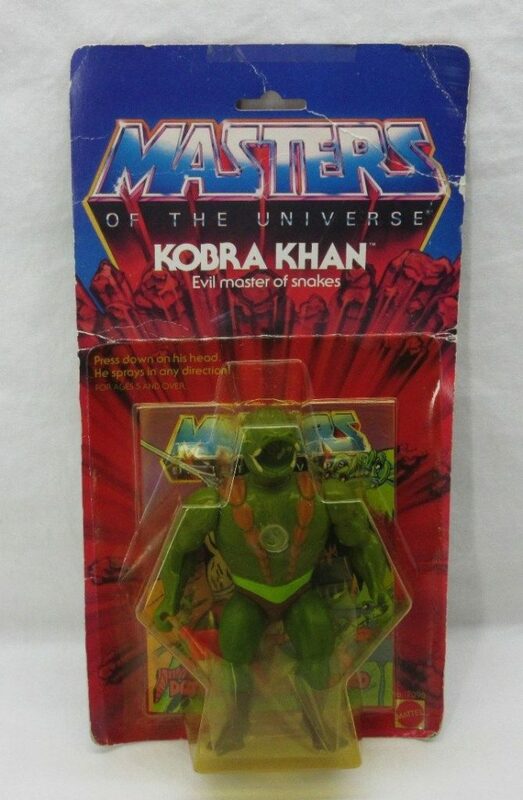 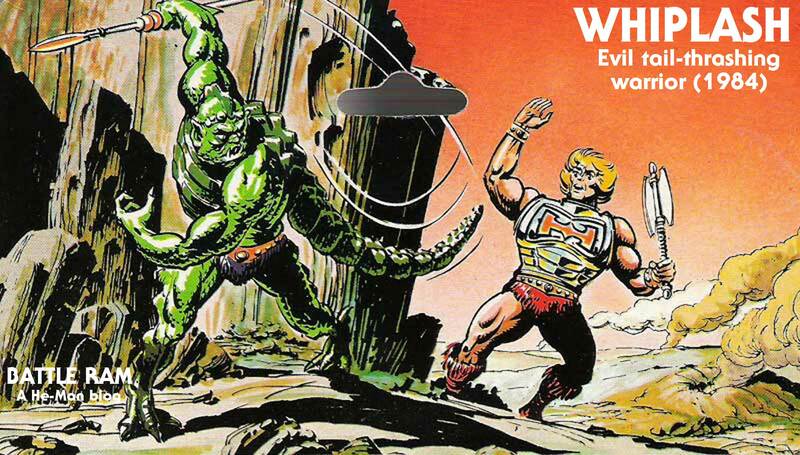 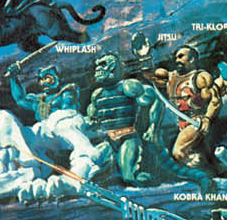 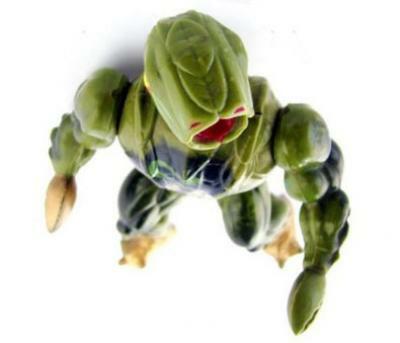 Whiplash, released in 1984, was part of a series of five animal-themed figures released in the third wave of the Masters of the Universe toyline, which also included Clawful, Buzz-Off, Webstor and Kobra Khan. 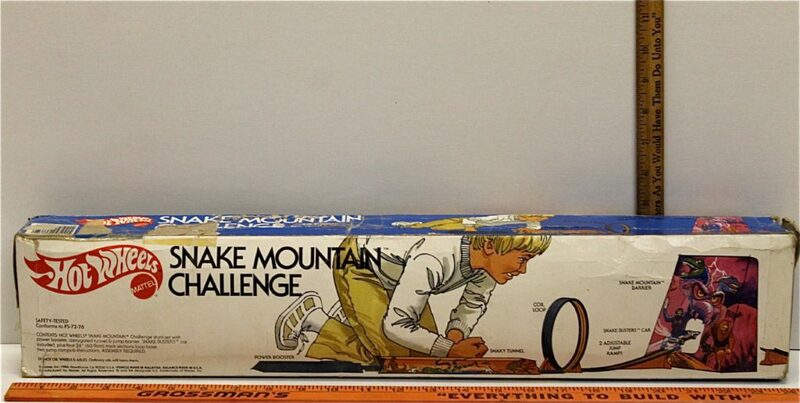 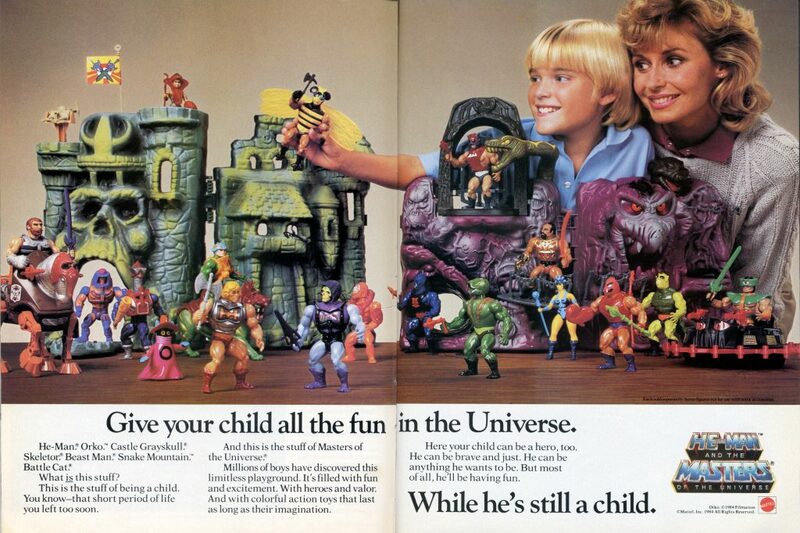 I had something of a love affair with the figure as a kid. 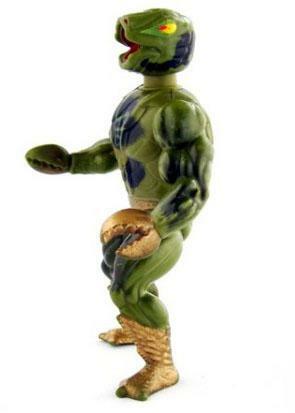 I distinctly remember the existential agony of having to choose between him and Clawful at the store. 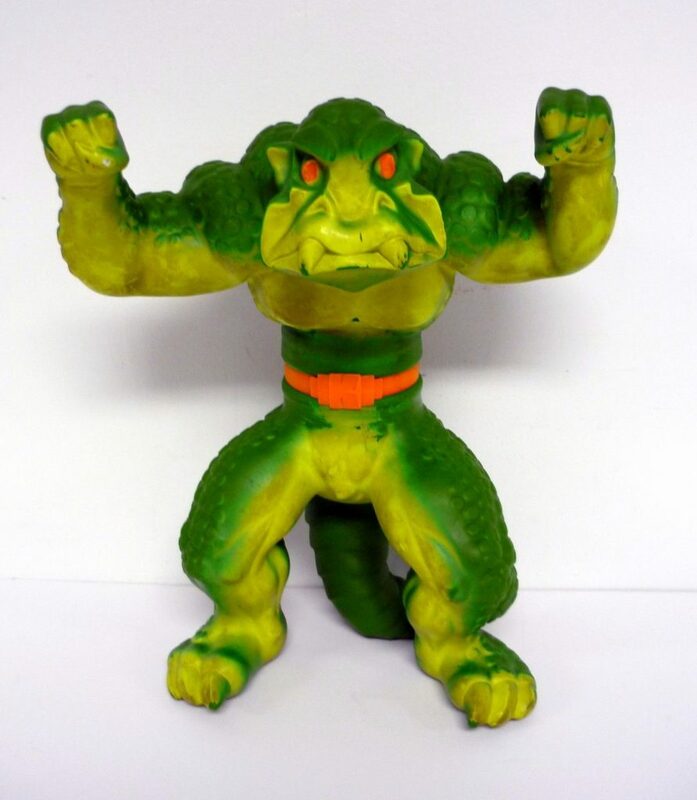 Ultimately I went with Clawful, but it could have gone either way. 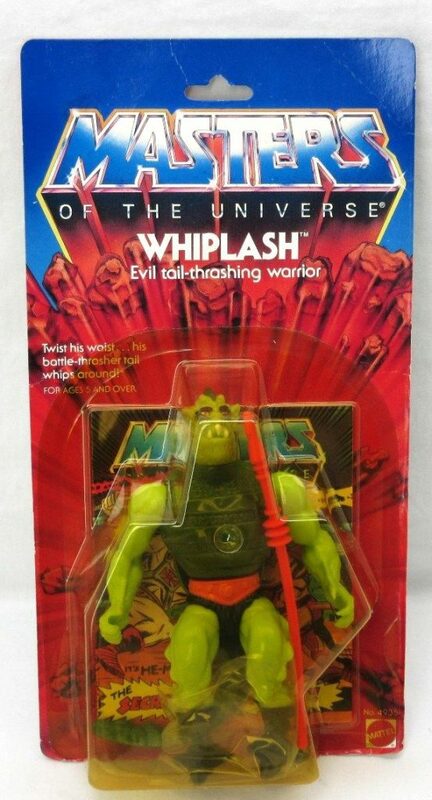 I remember spending a lot of time playing with Whiplash despite that, so I think I was either able to borrow one from a friend or get my own later. 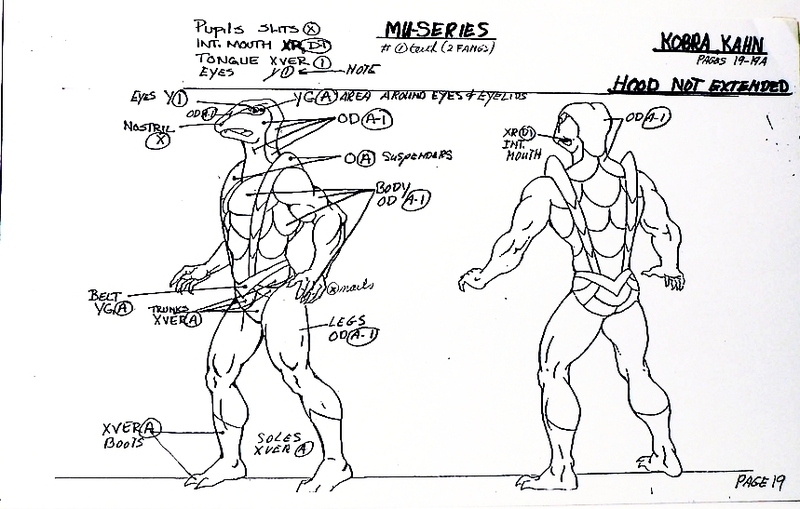 Just about everything I have to say about the development of Whiplash’s design was already said several years ago by James Eatock, in his excellent “Behind the Scenes – The Evolution of Whiplash” video. 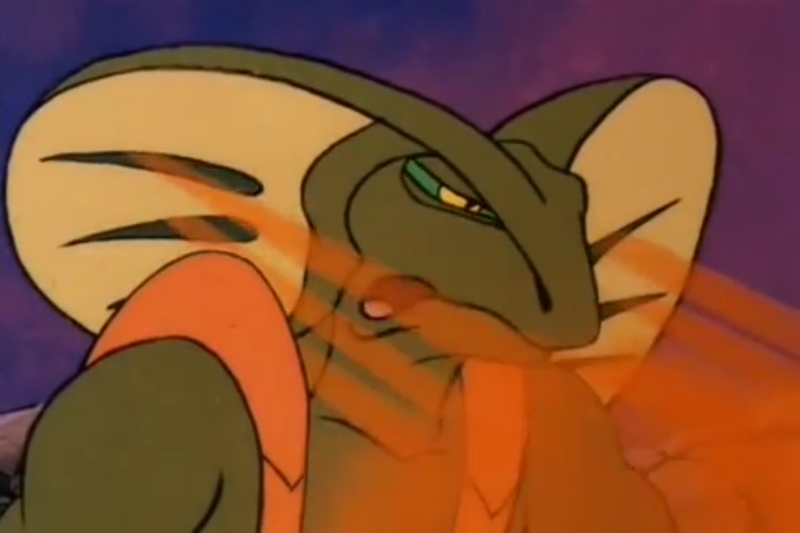 I’m including James’ video below, but I’ll also go over the details myself. 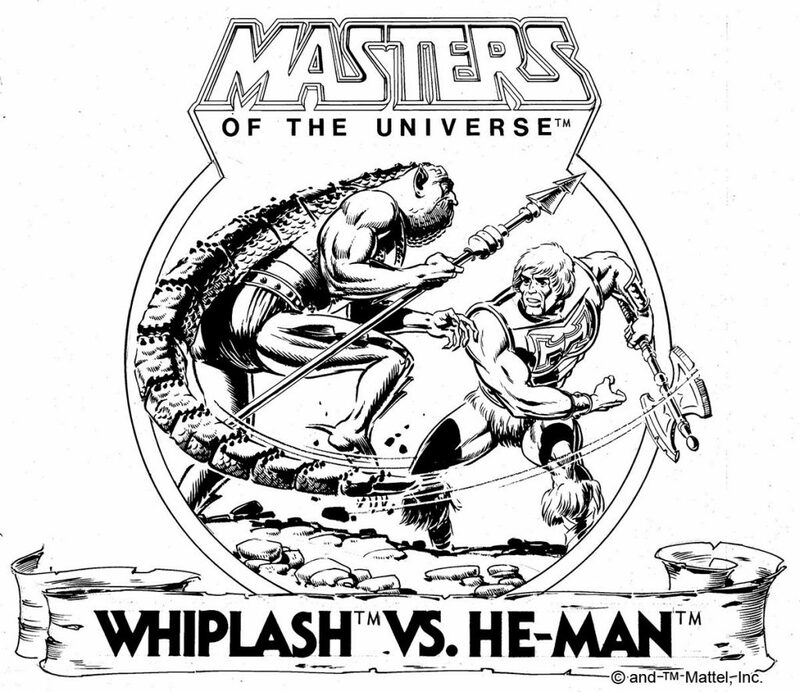 Whiplash was designed by Colin Bailey in July of 1982. 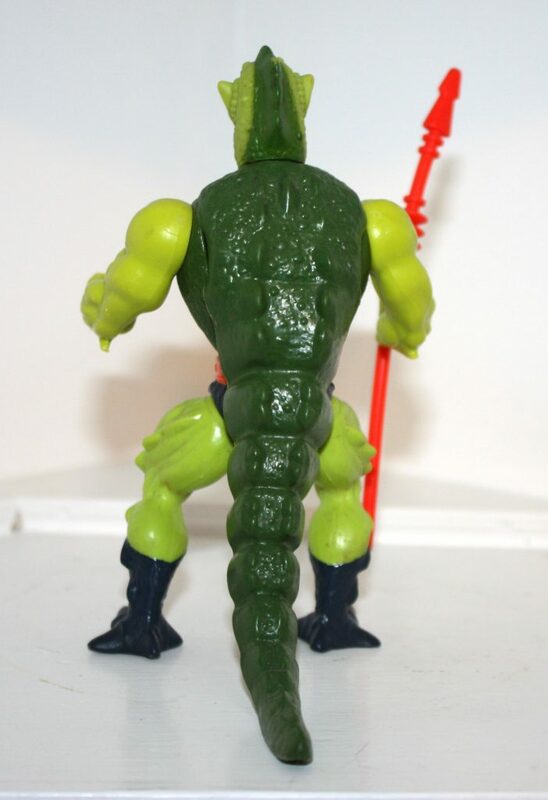 His original concept, shown below, is in many ways quite different from the final toy, but there are points of convergence as well. 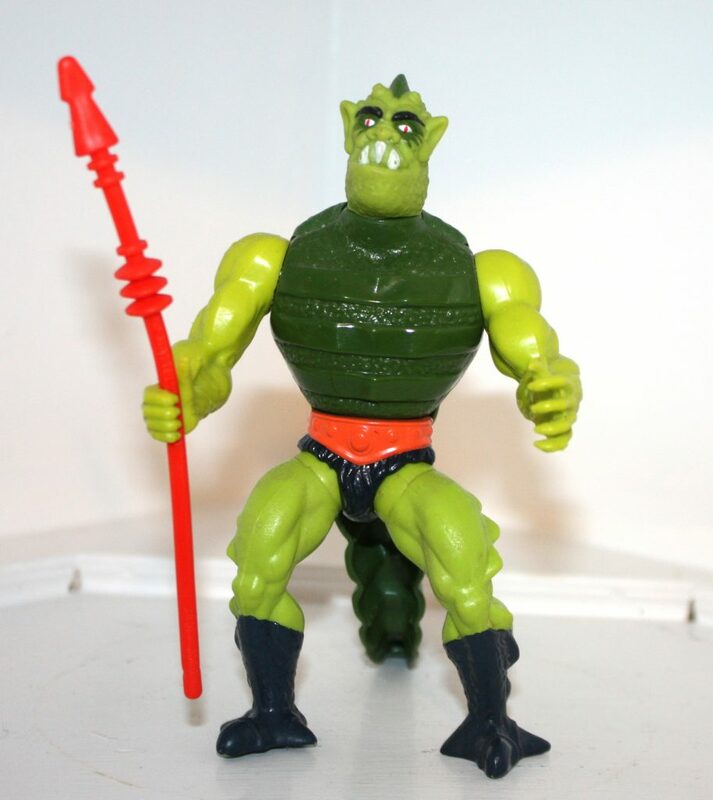 The character has the same widely-splayed four toed feet and troll-like facial features that the final toy had. 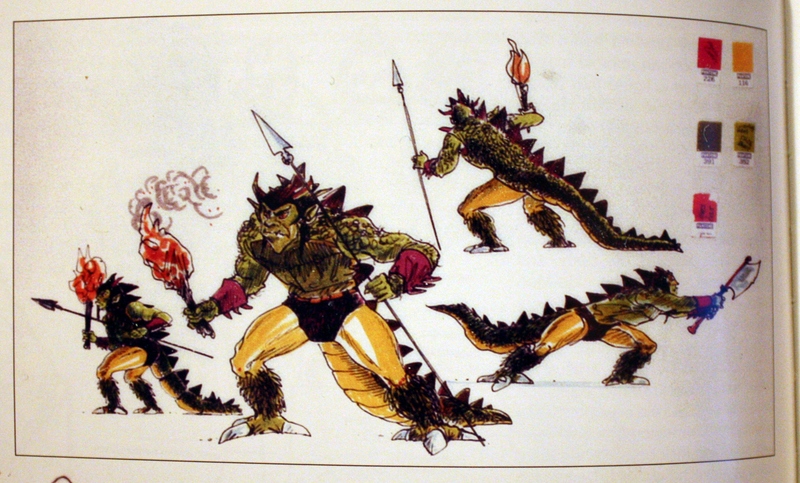 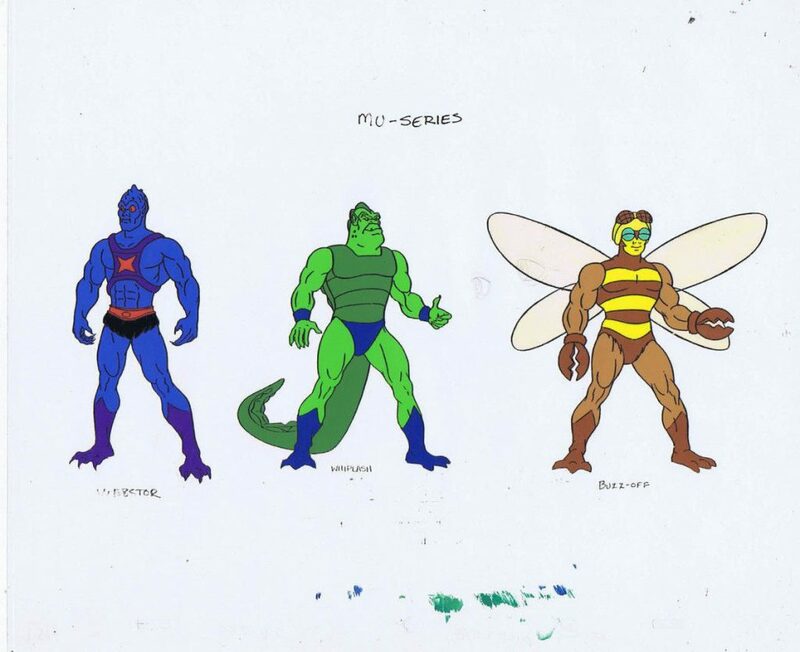 However, this concept character, called Lizard Man, had strangely furry calves, yellow legs, prominent spinal ridges, spikey violet bracers, and two prominent horns. 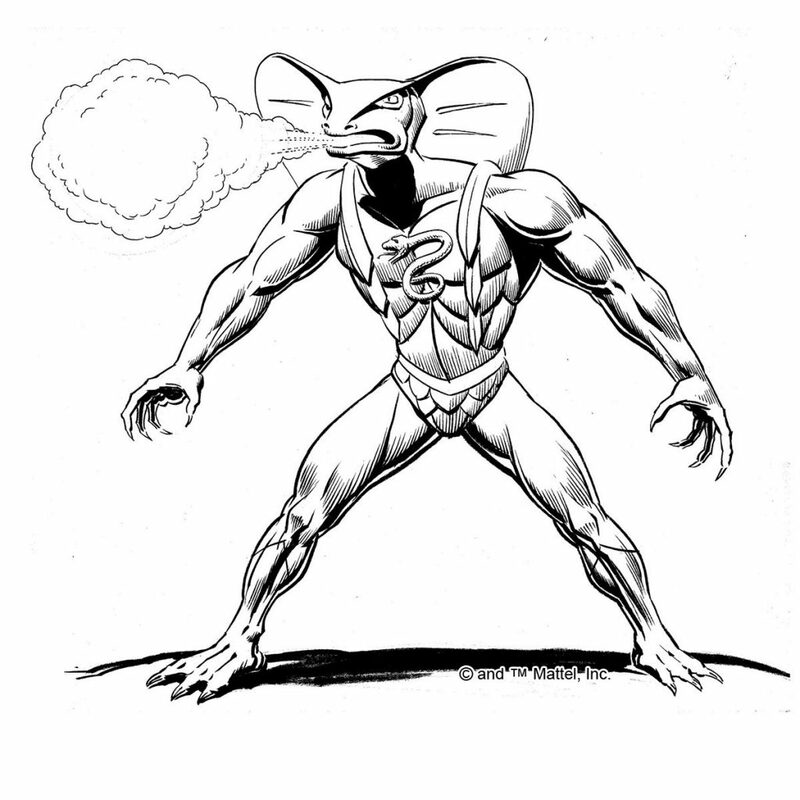 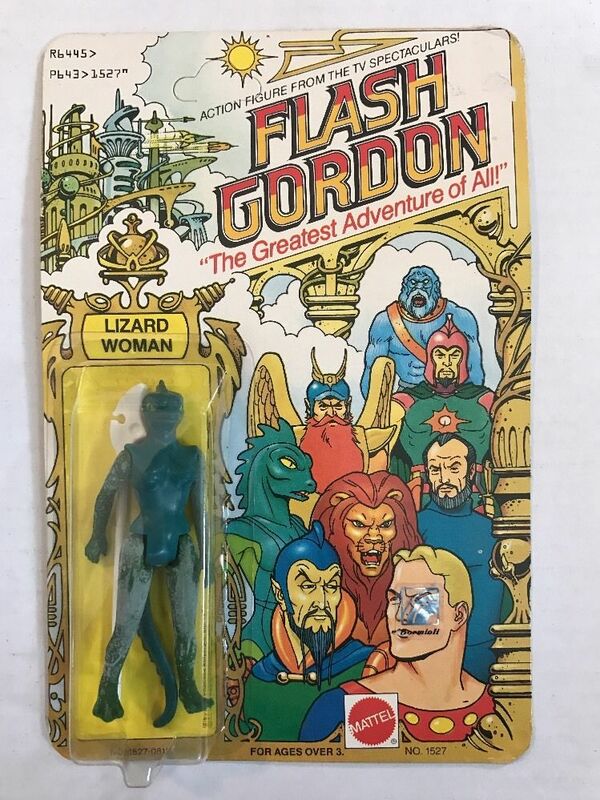 LIZARD MAN – moves quietly, quickly and has the agility of his namesake. 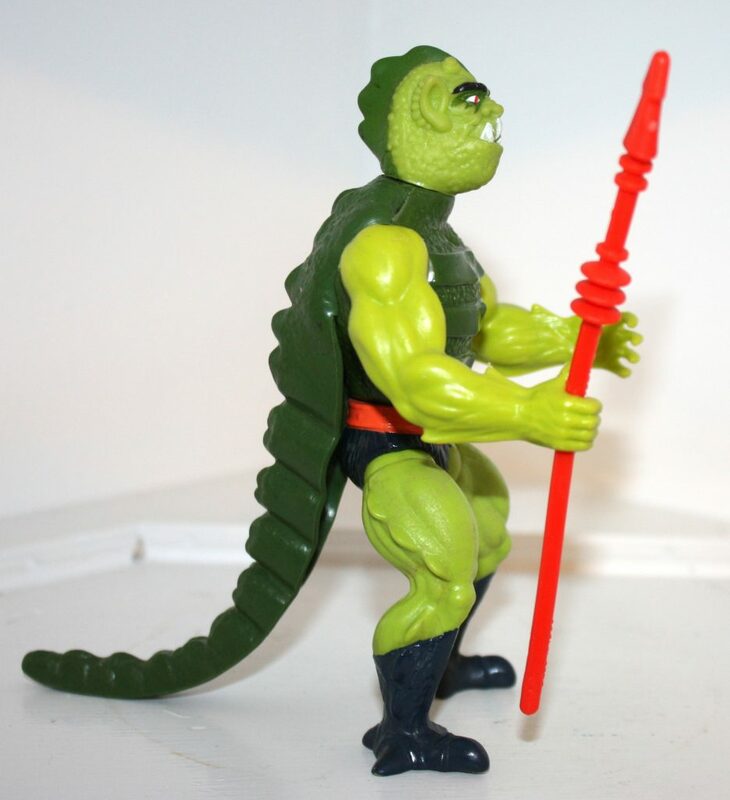 He climbs perpendicular walls and his tough lizard skin provides protection against most of his enemies. 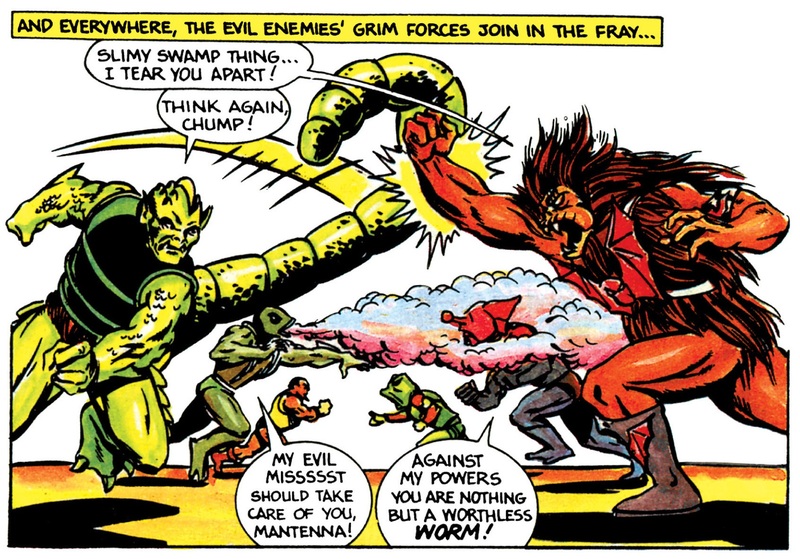 Liz has one drawback — every year he molts and becomes vulnerable to attack and completely useless to anyone. 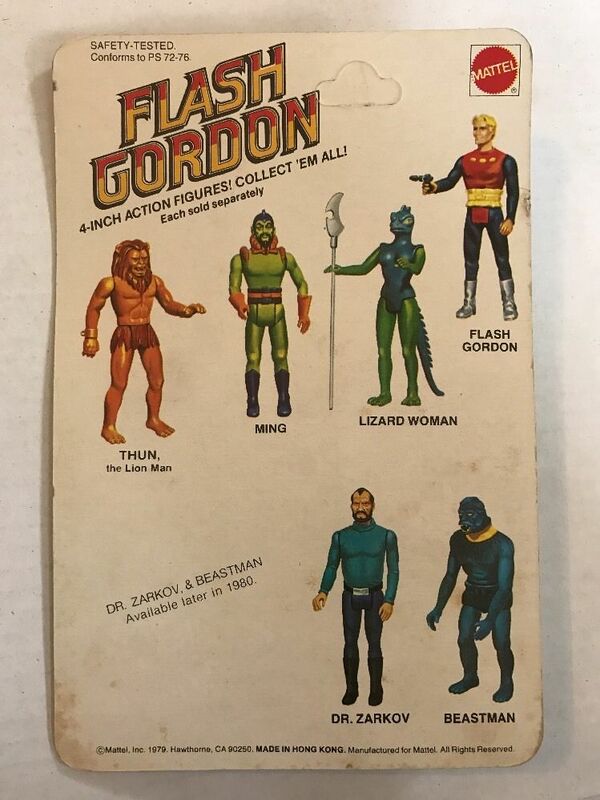 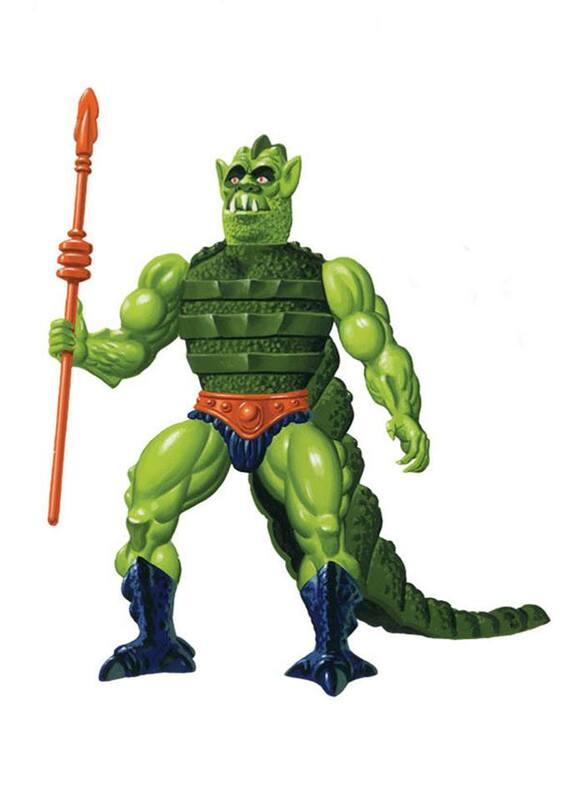 The final toy would have a much simplified two-tone green color scheme for his skin, with blue boots and loin cloth, and an orange belt. 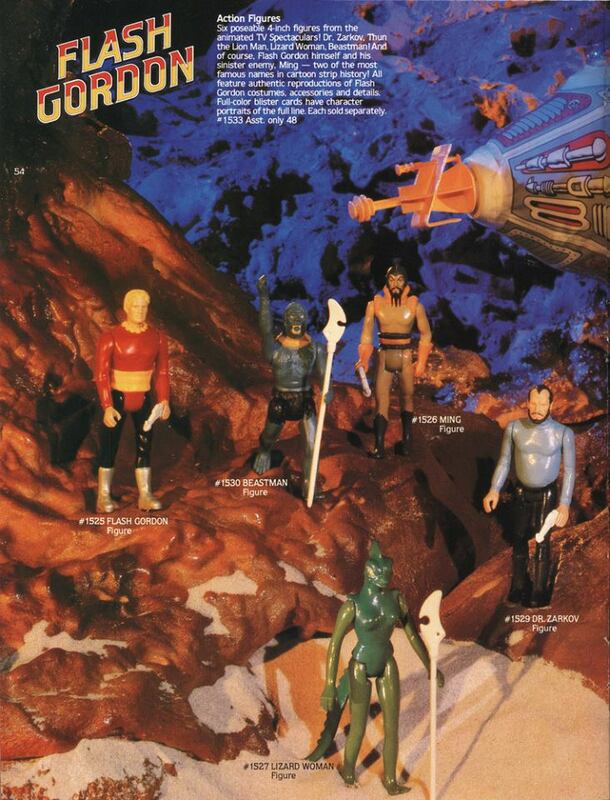 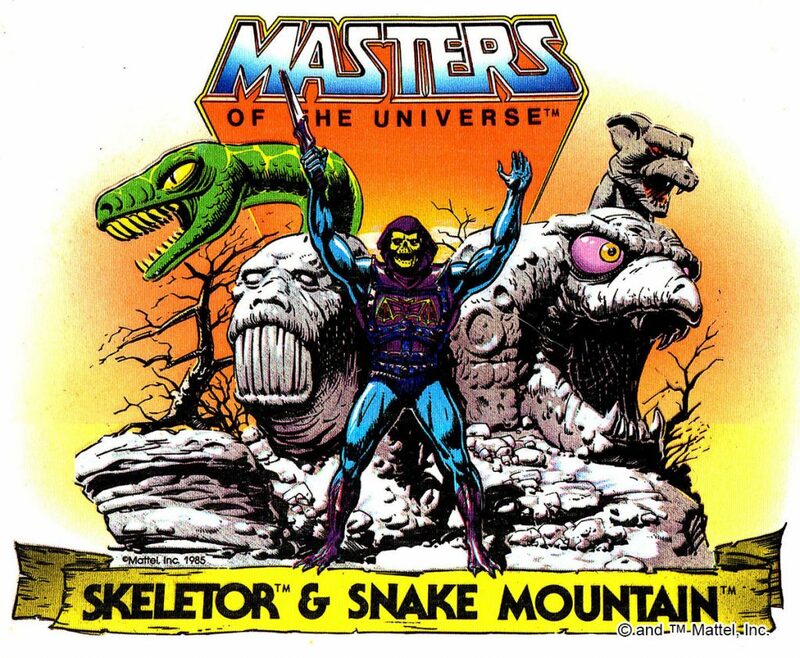 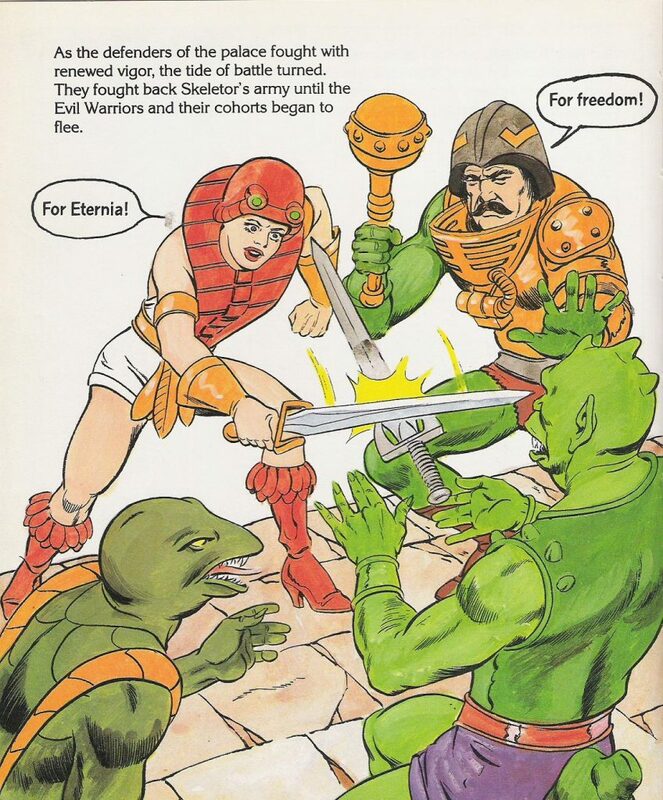 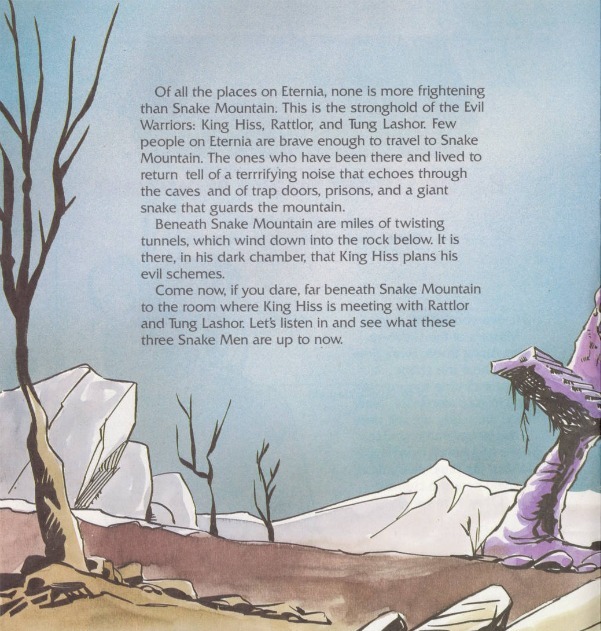 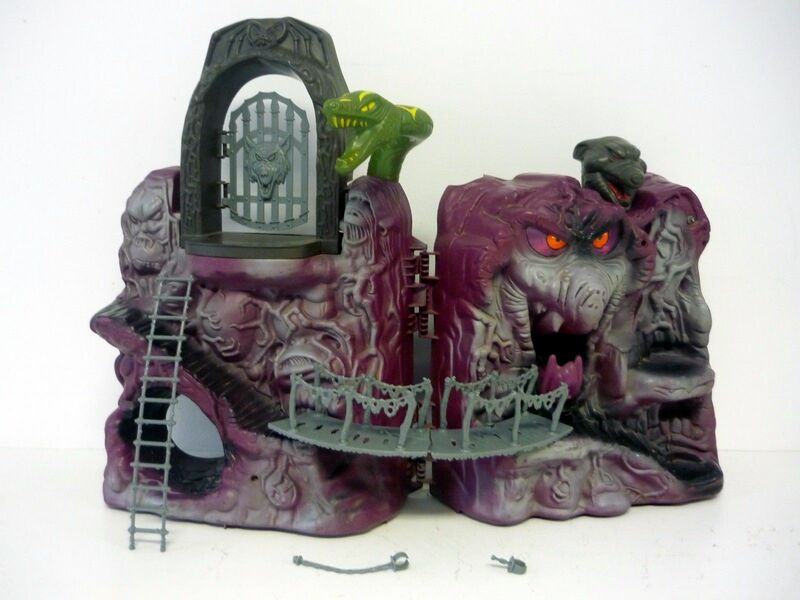 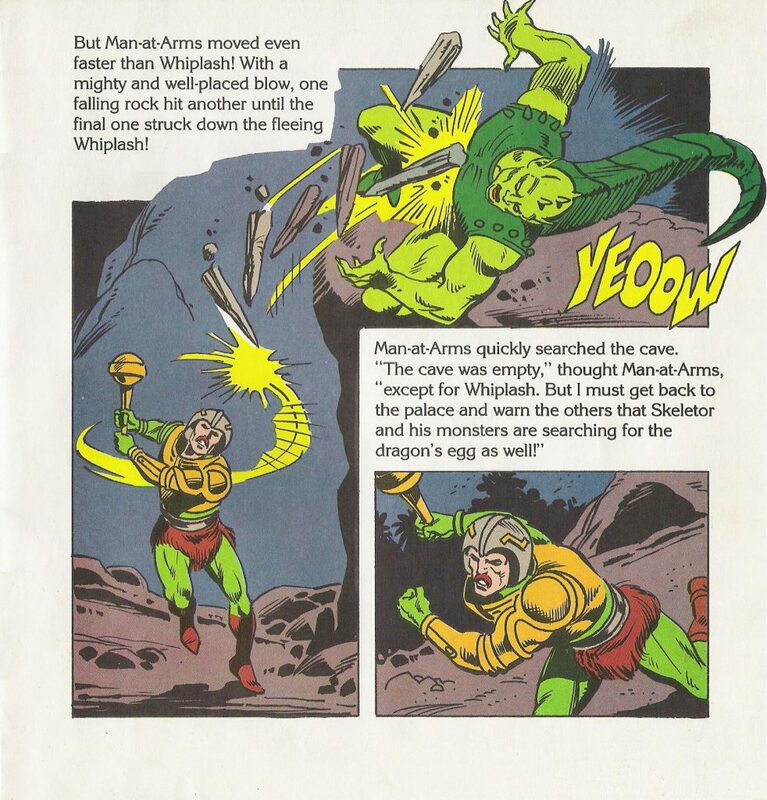 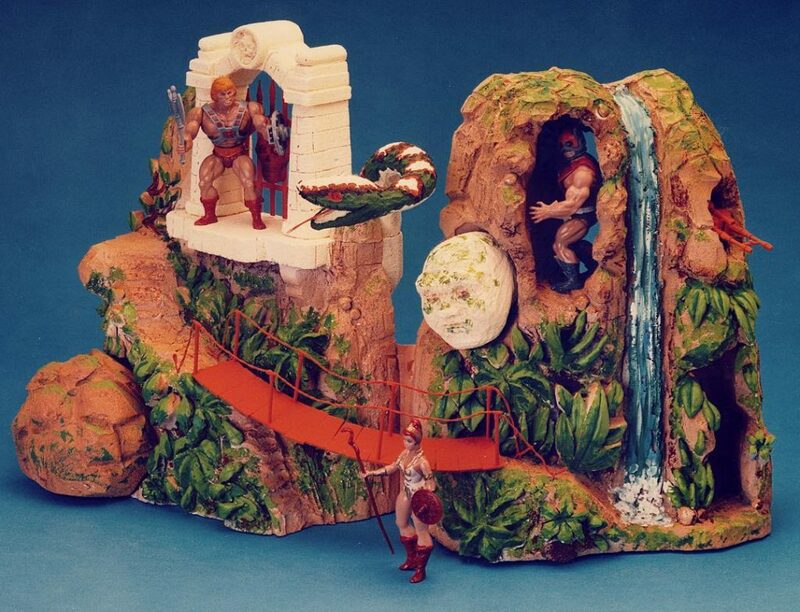 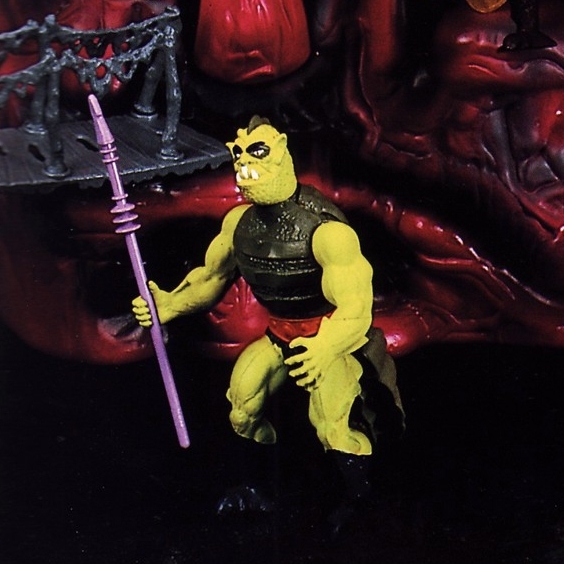 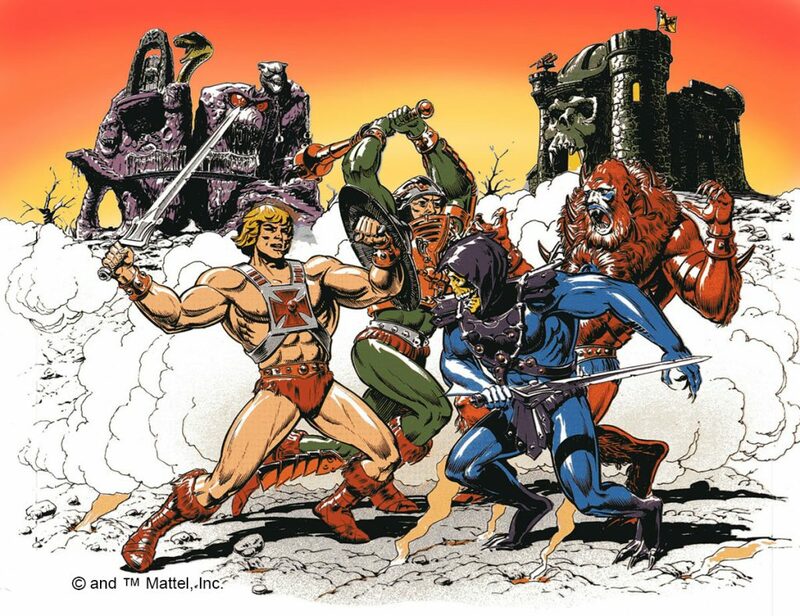 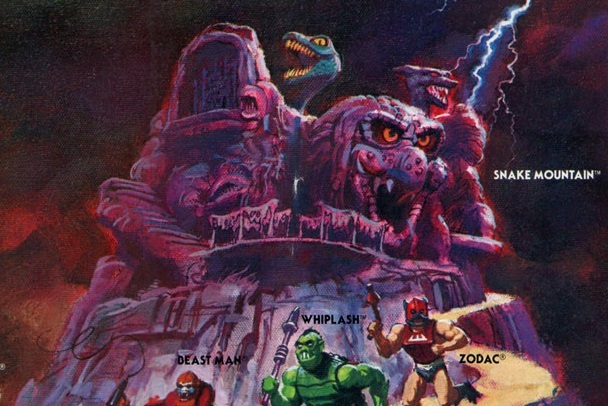 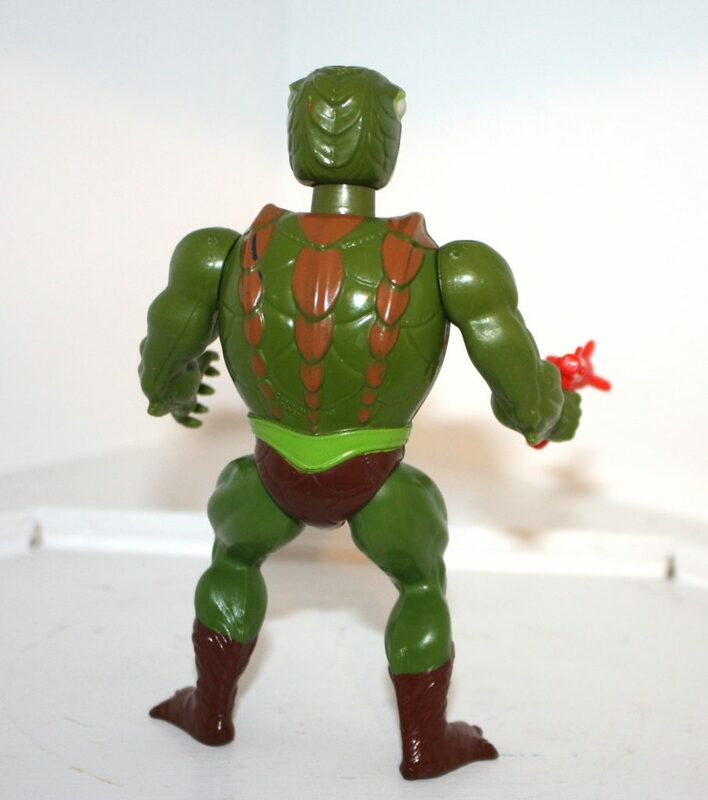 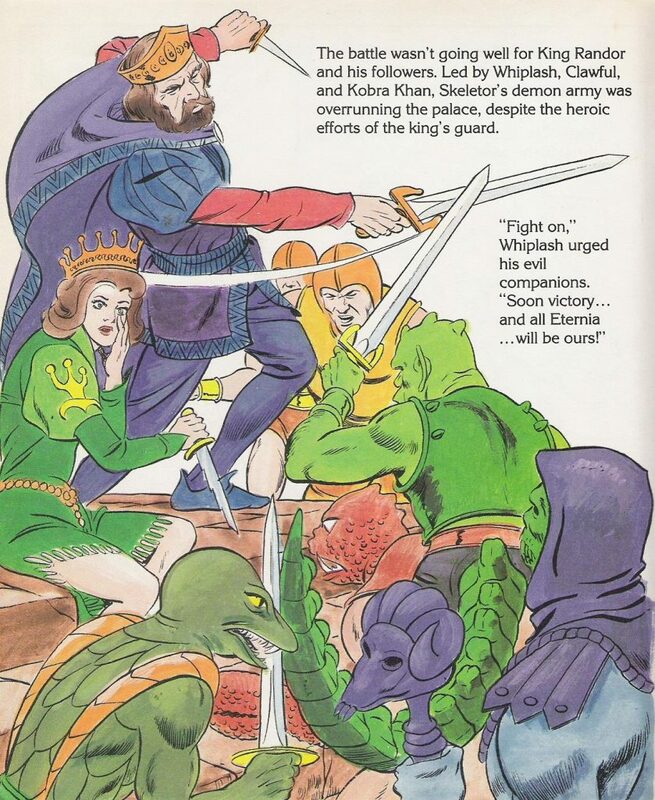 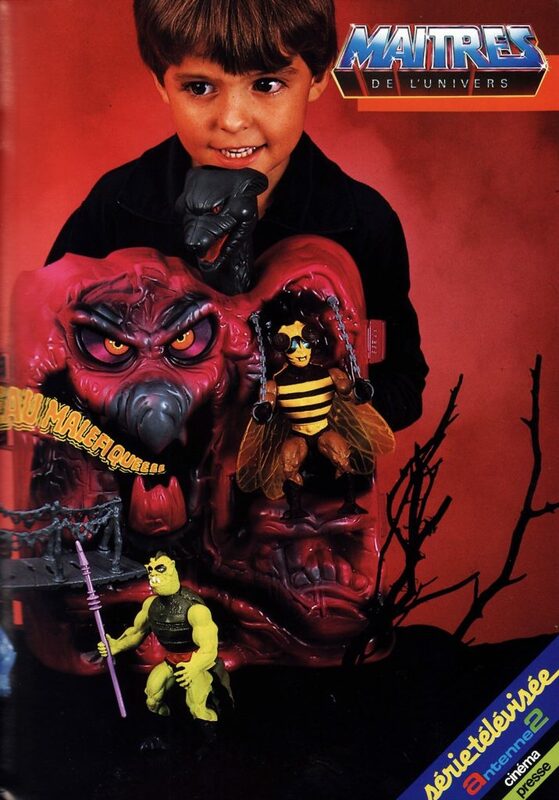 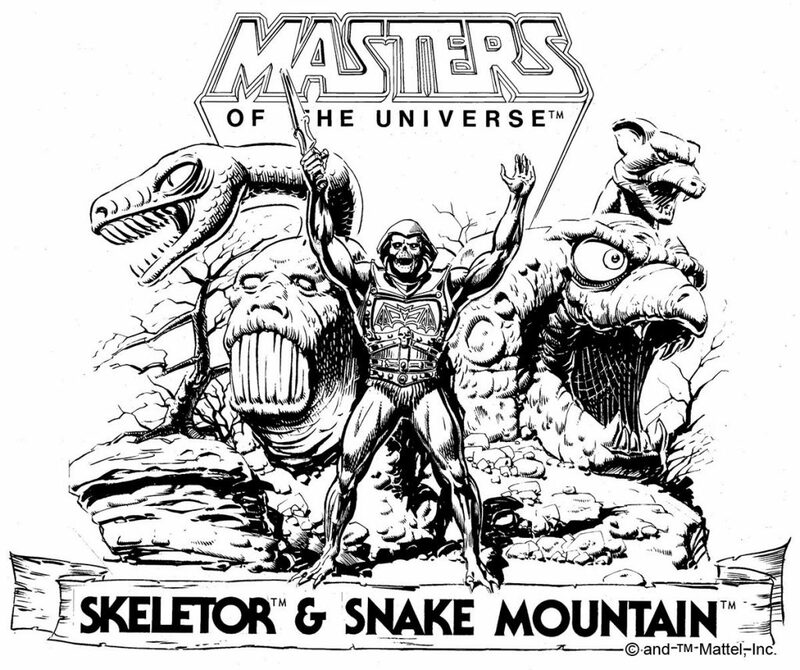 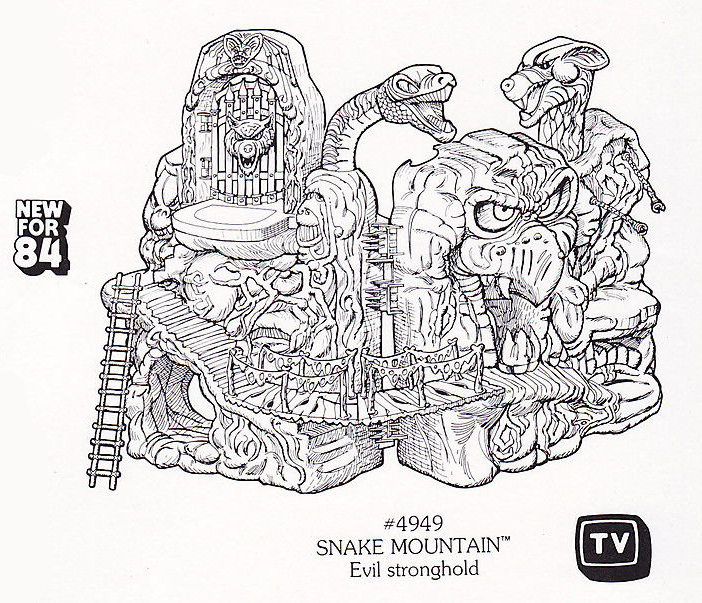 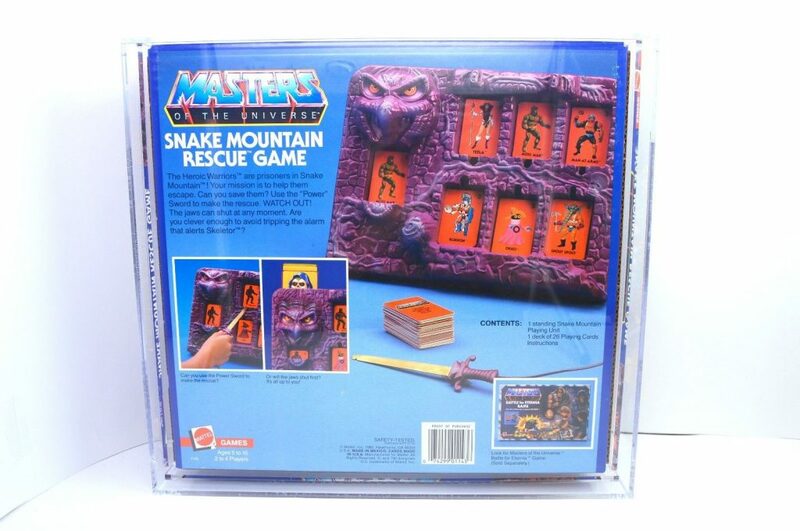 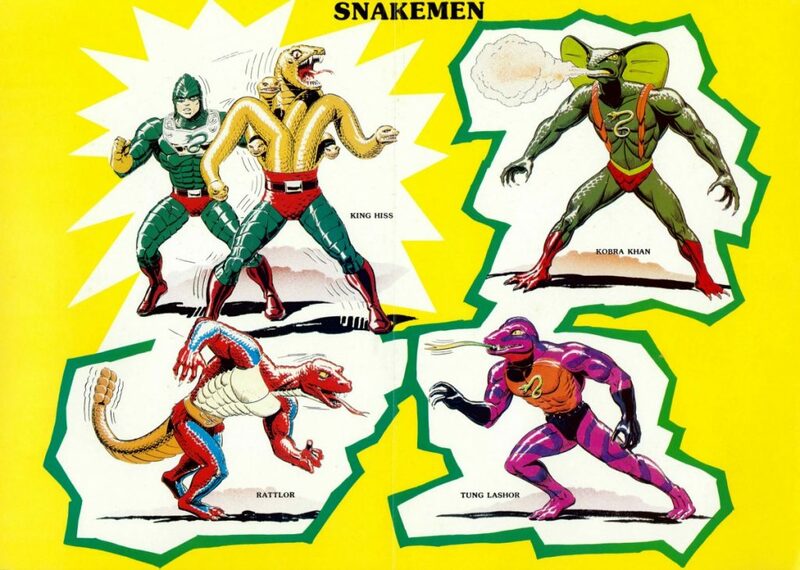 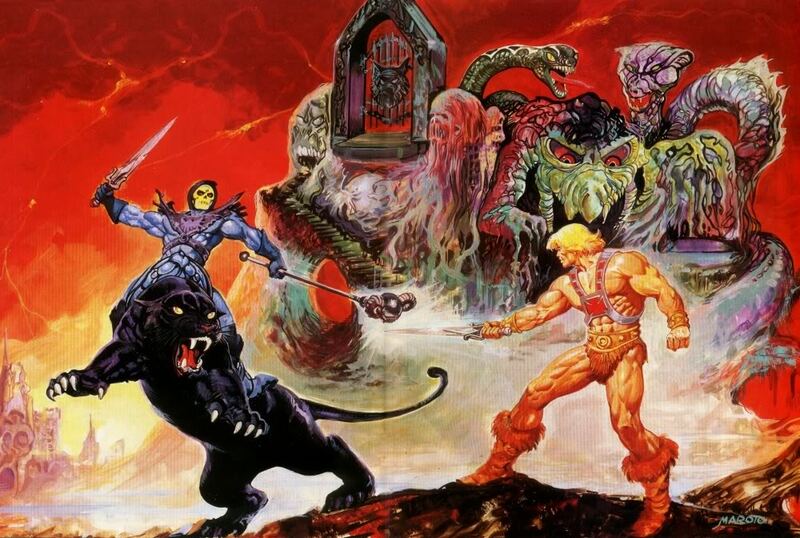 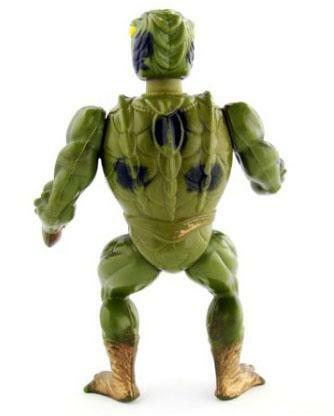 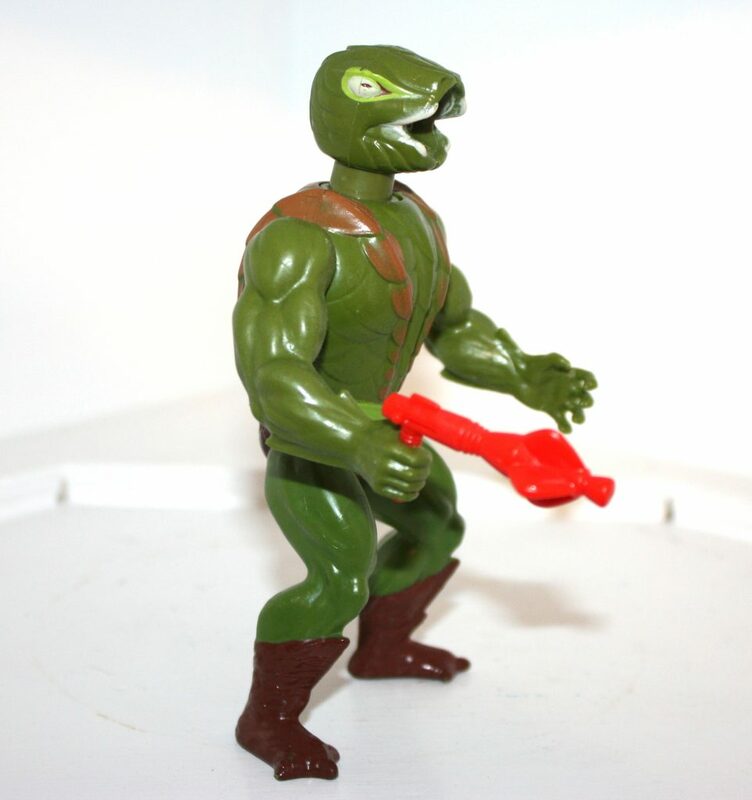 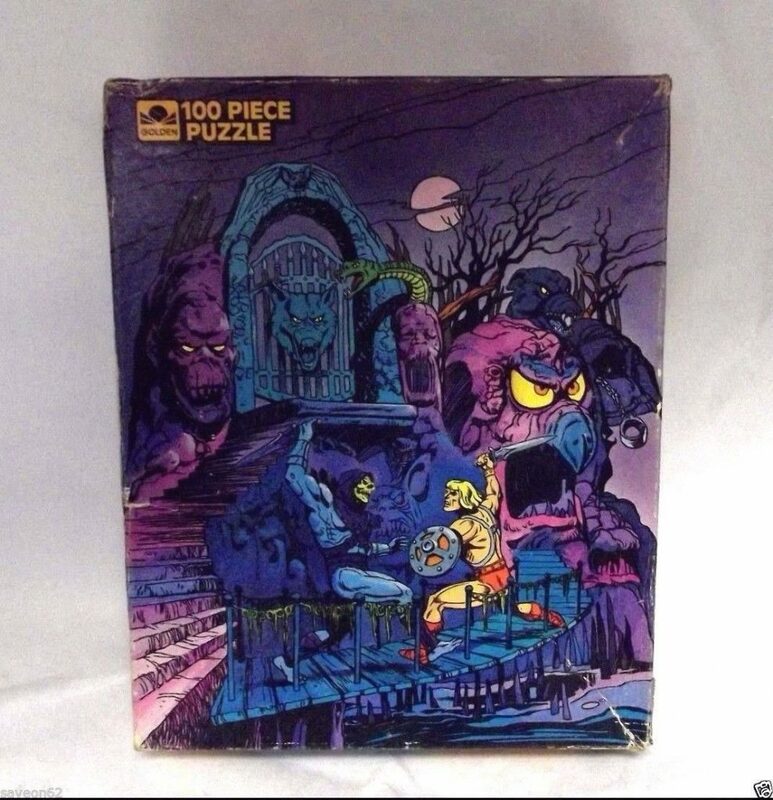 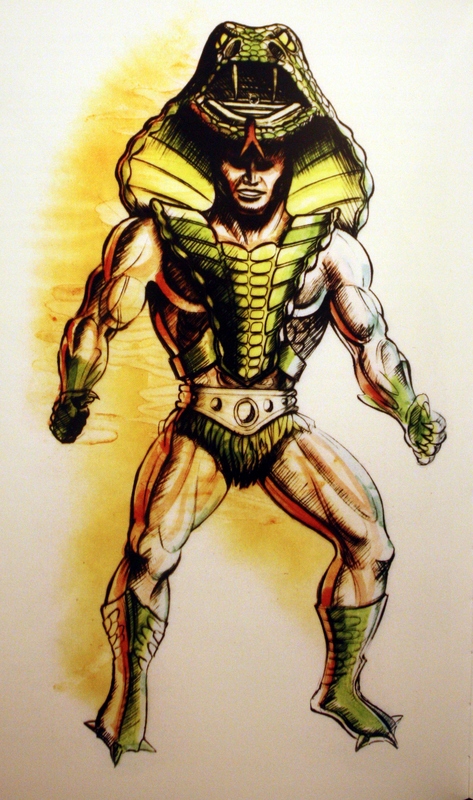 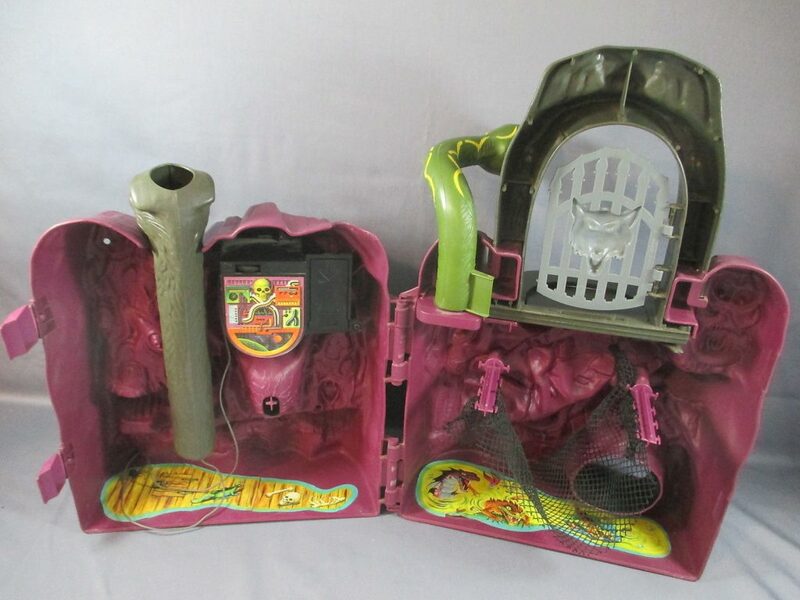 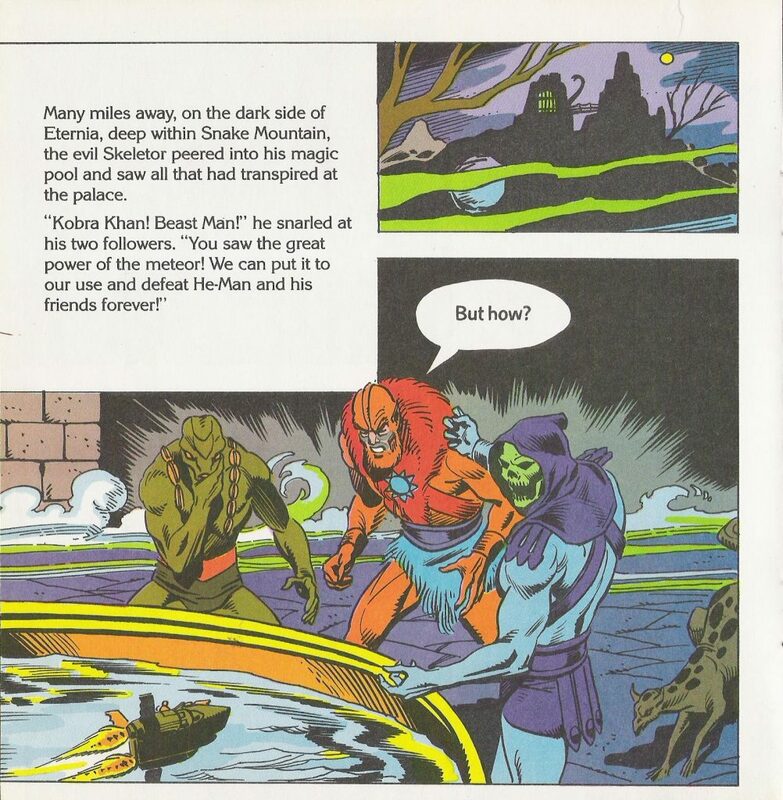 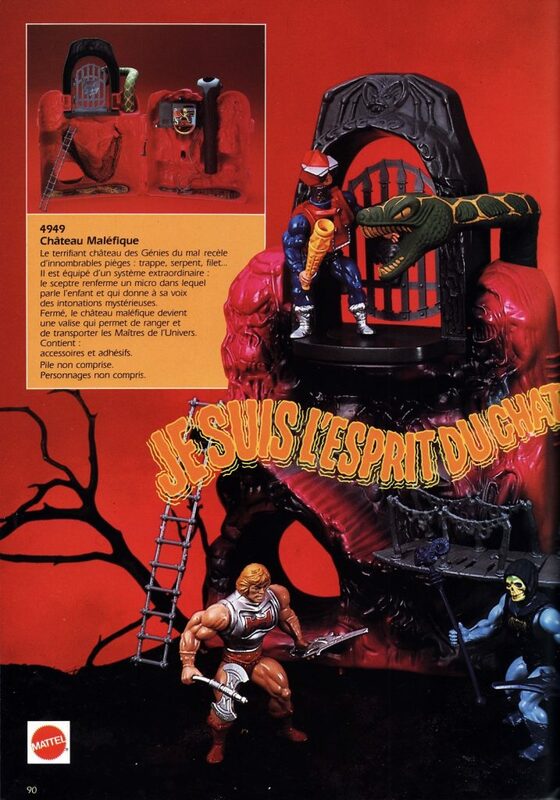 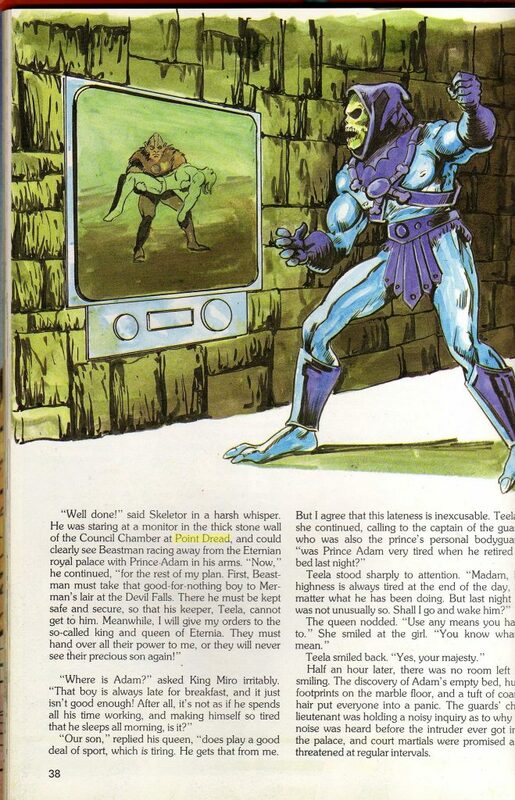 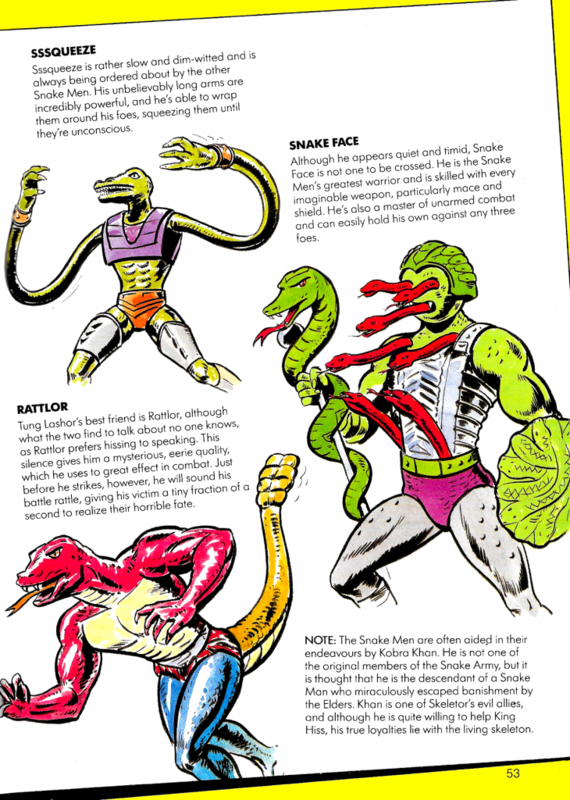 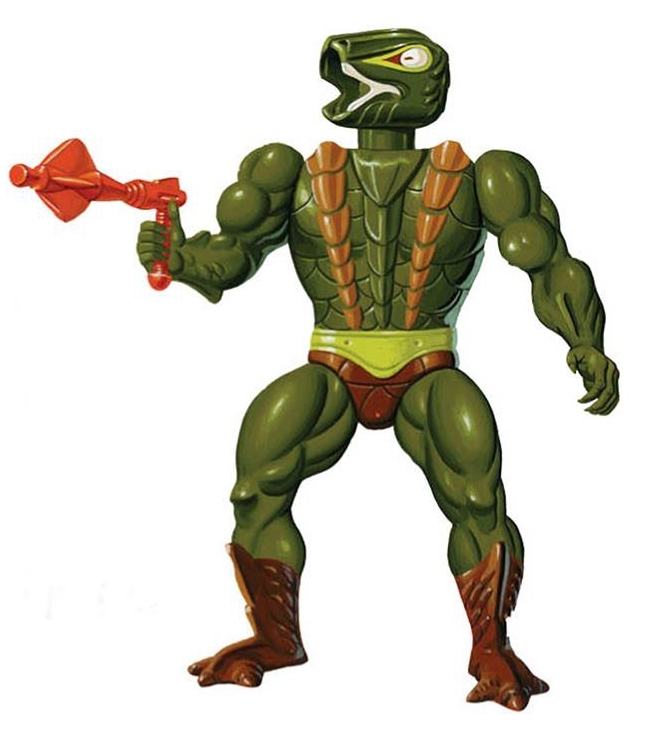 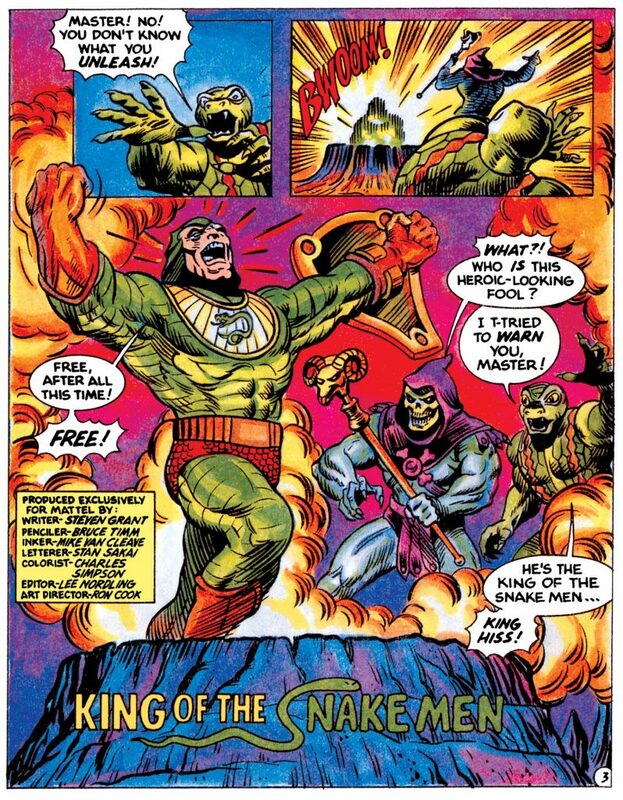 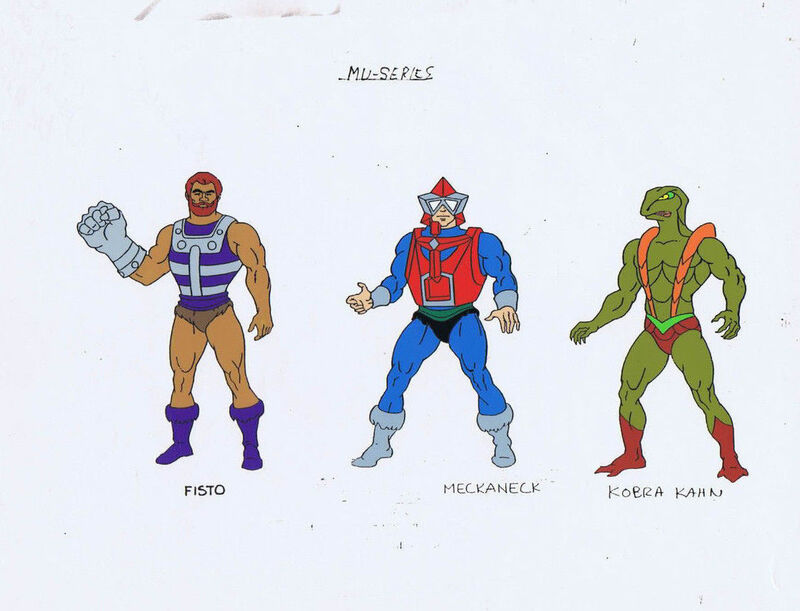 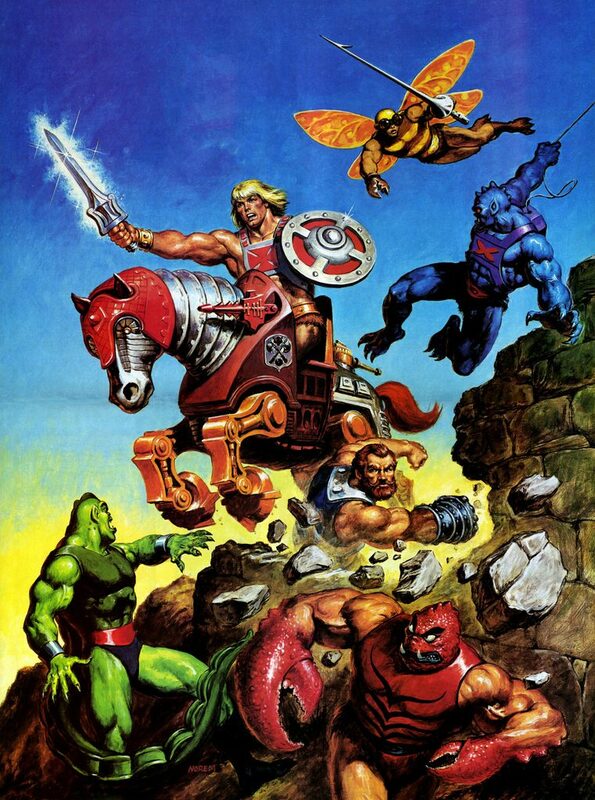 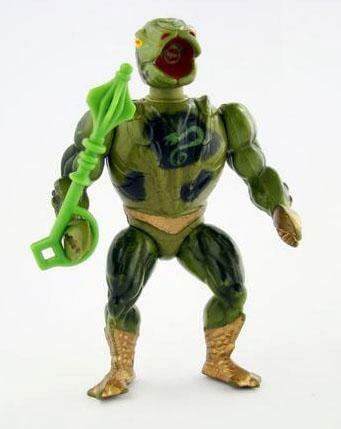 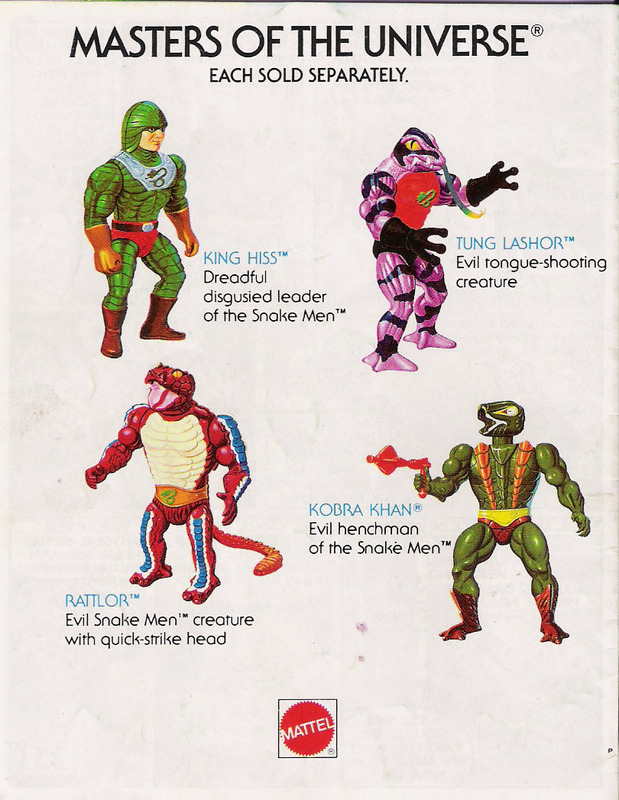 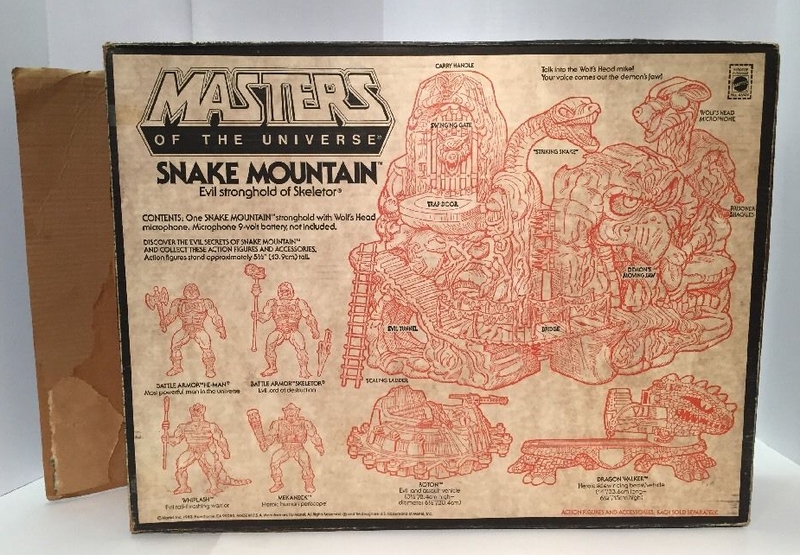 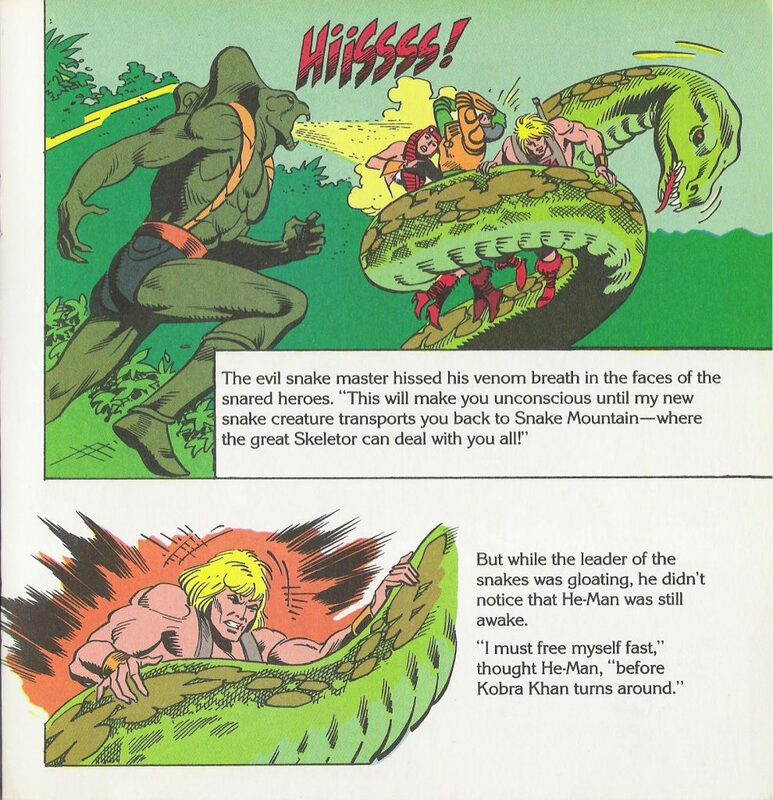 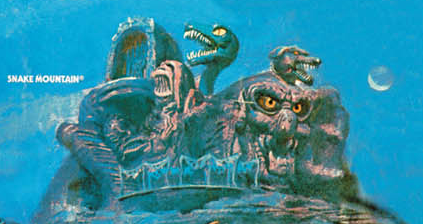 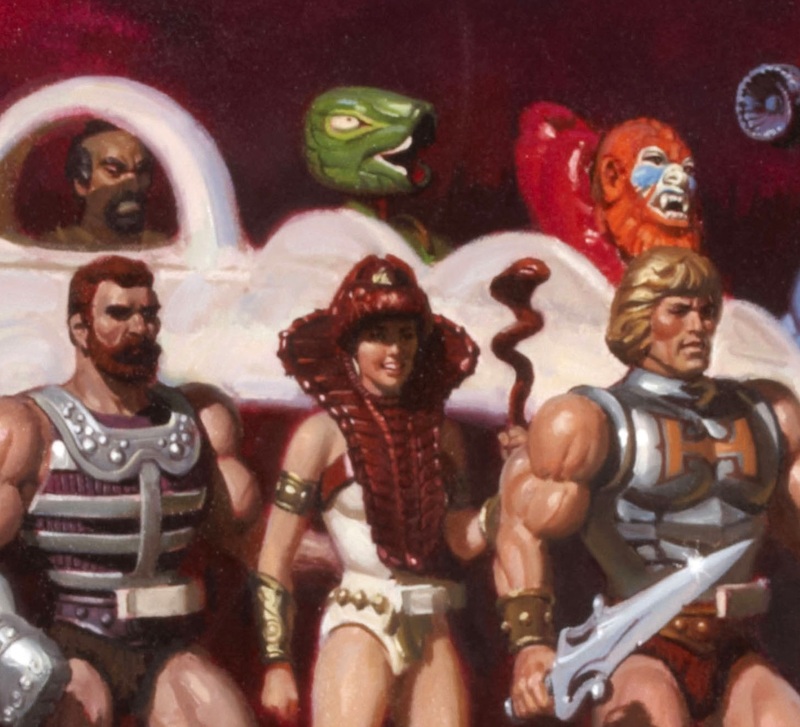 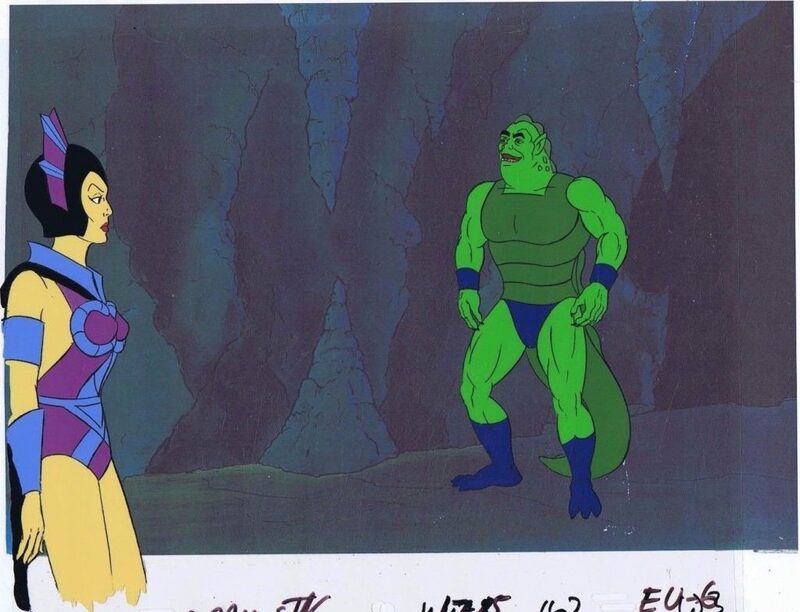 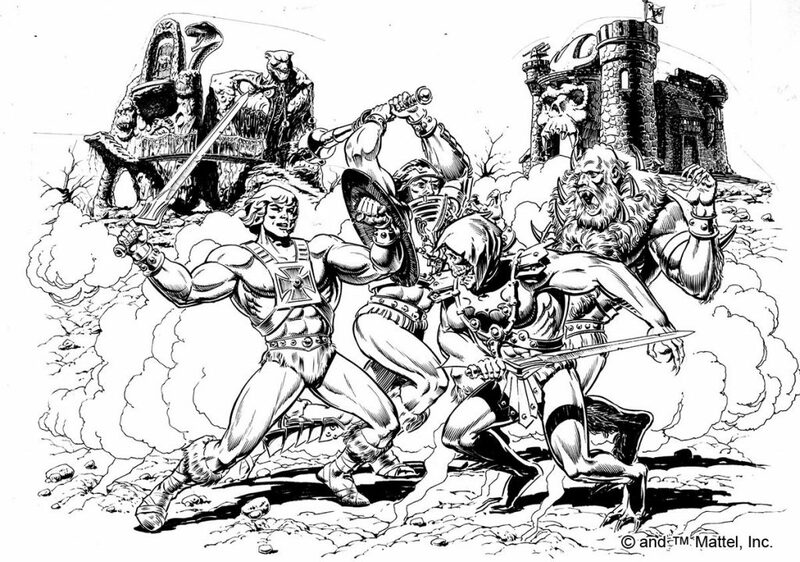 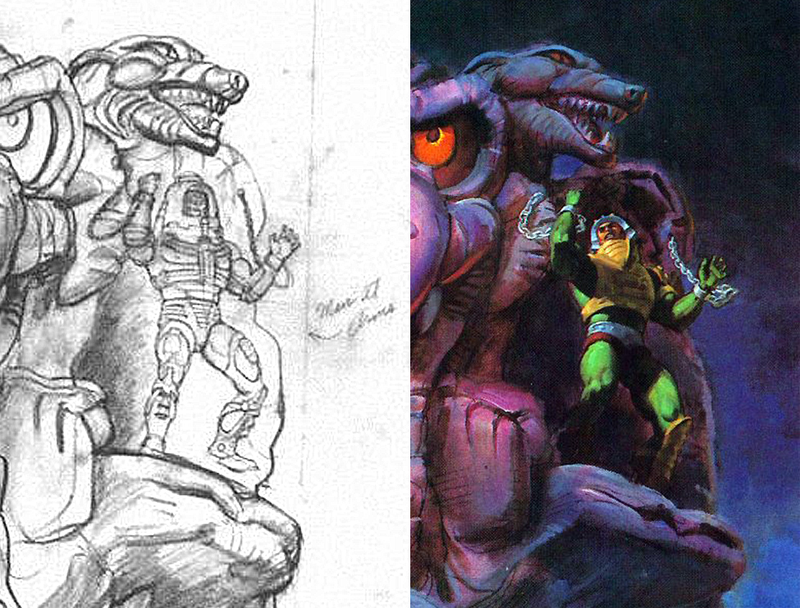 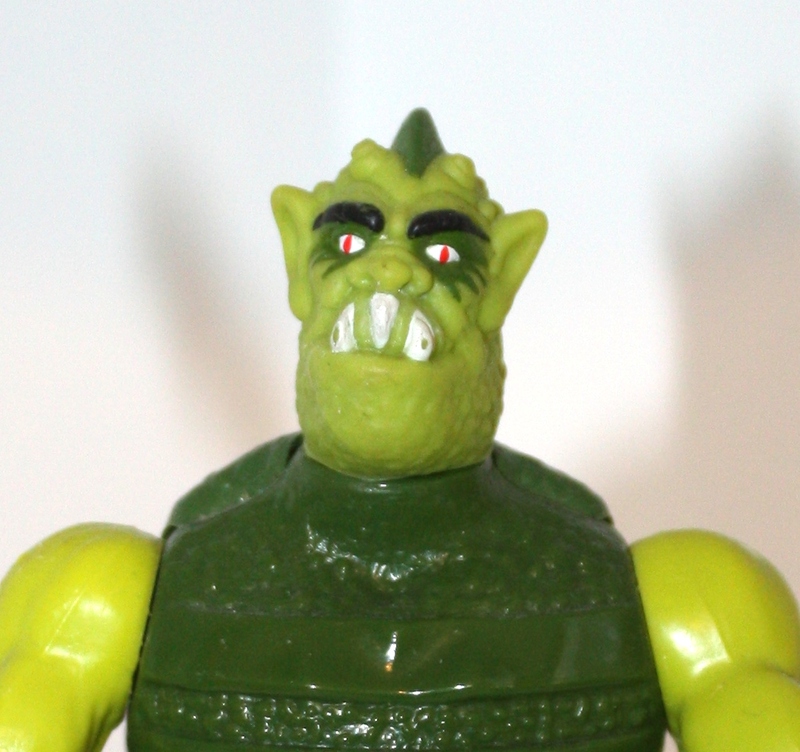 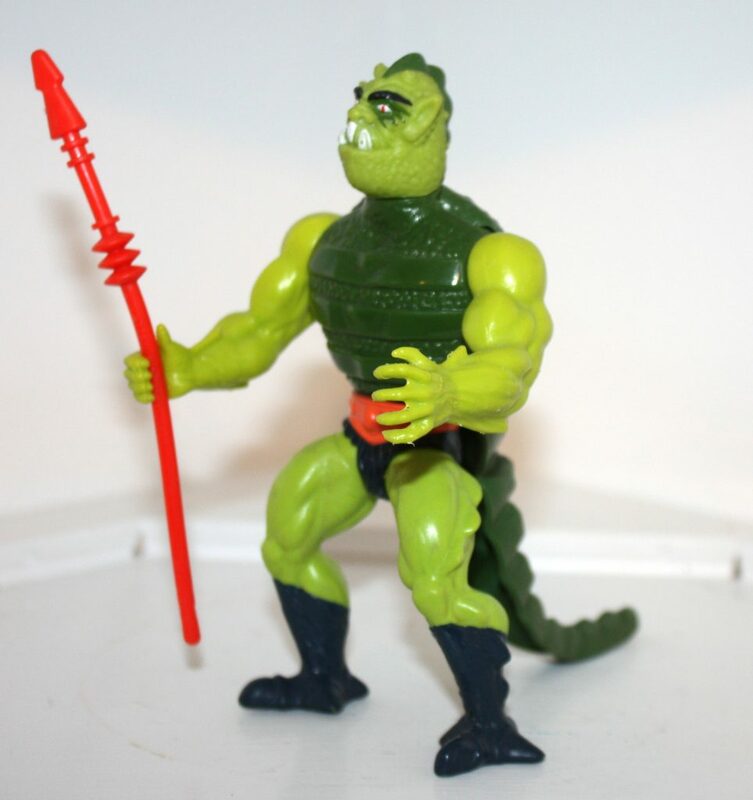 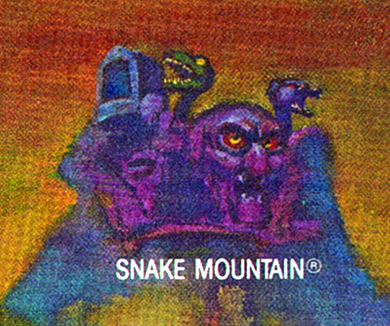 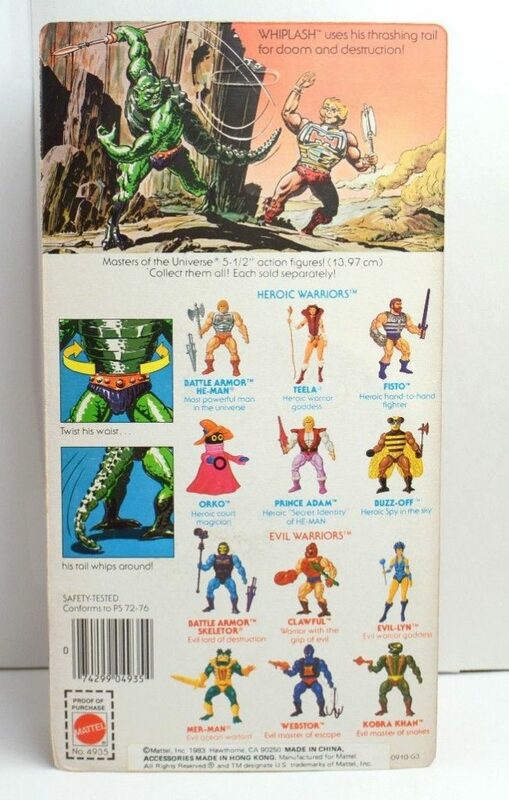 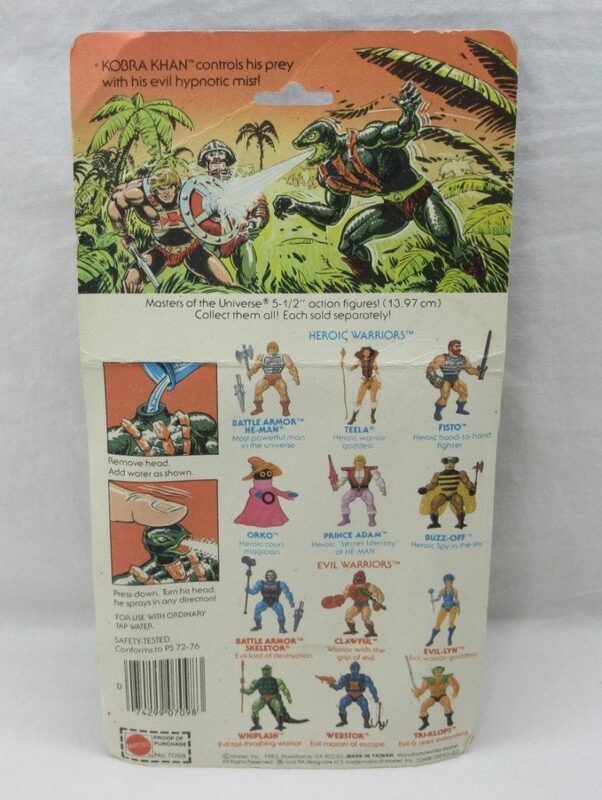 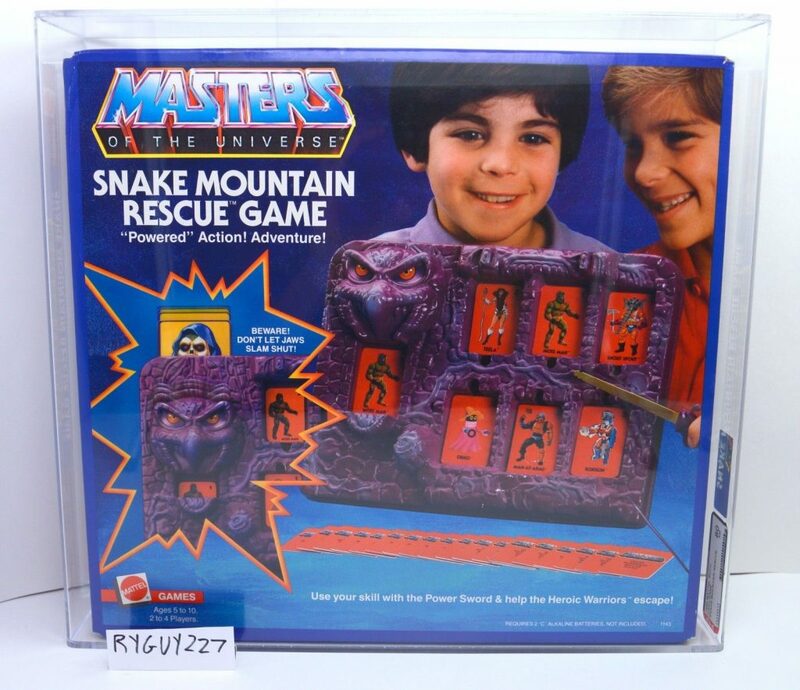 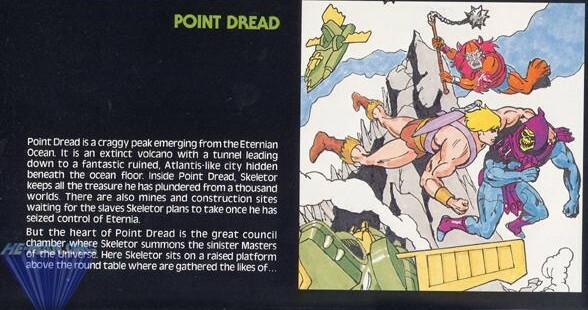 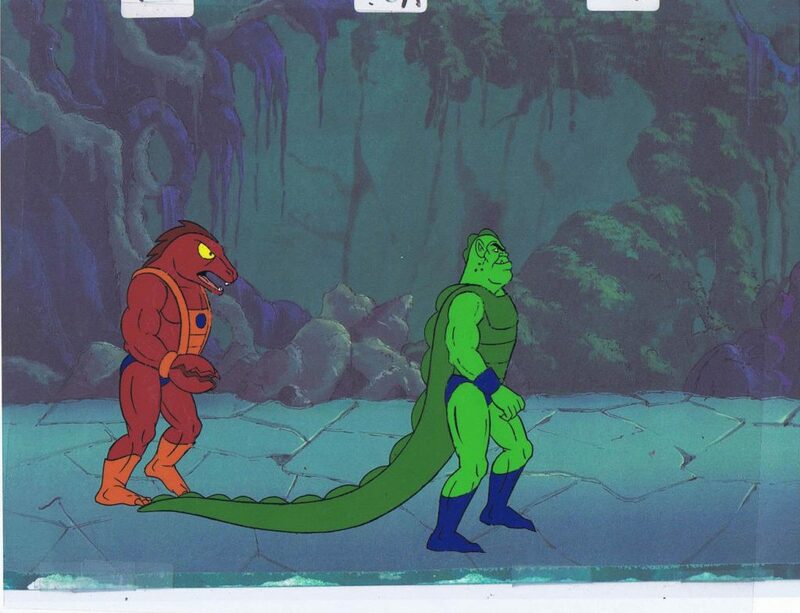 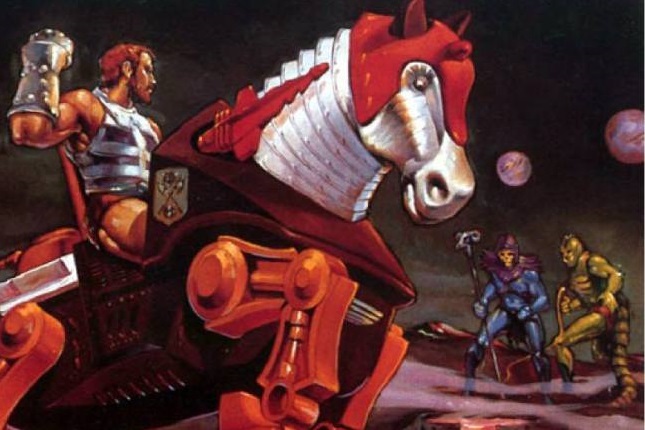 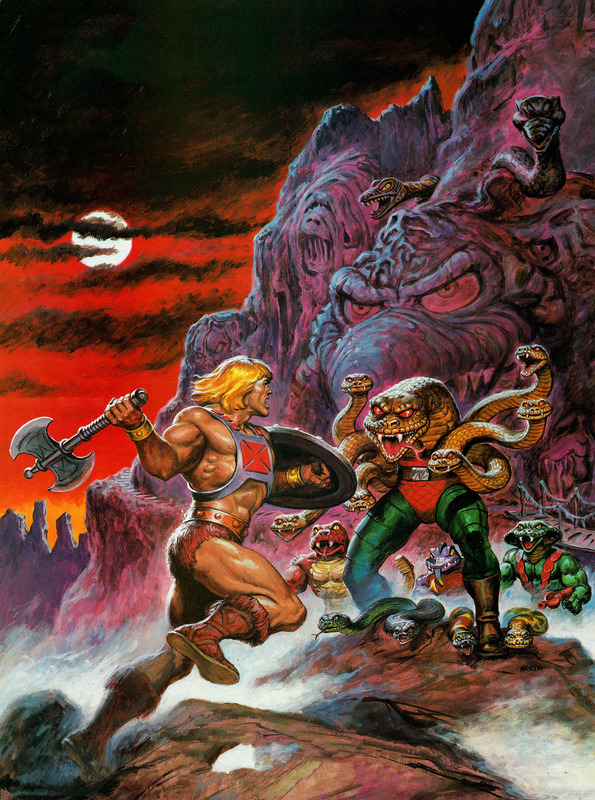 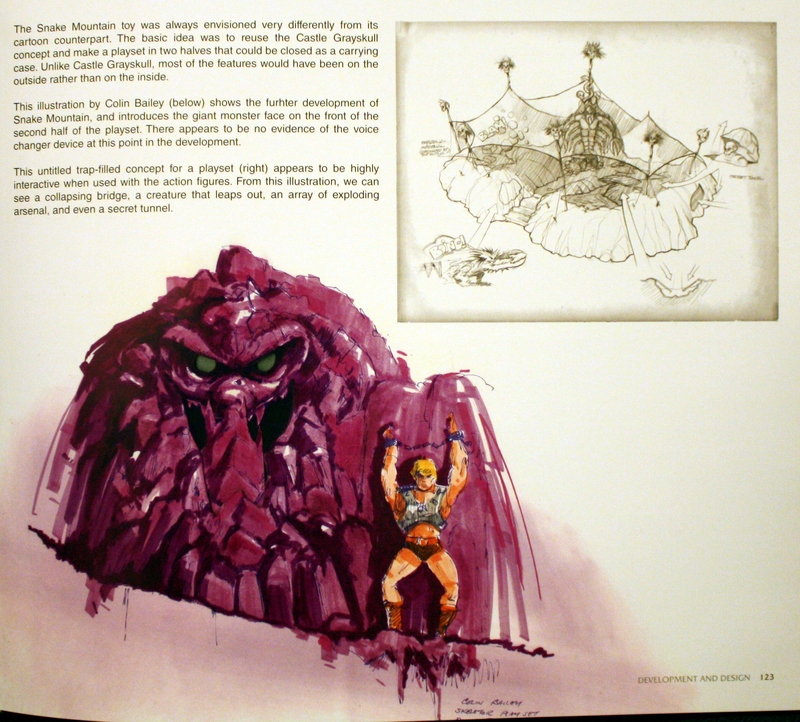 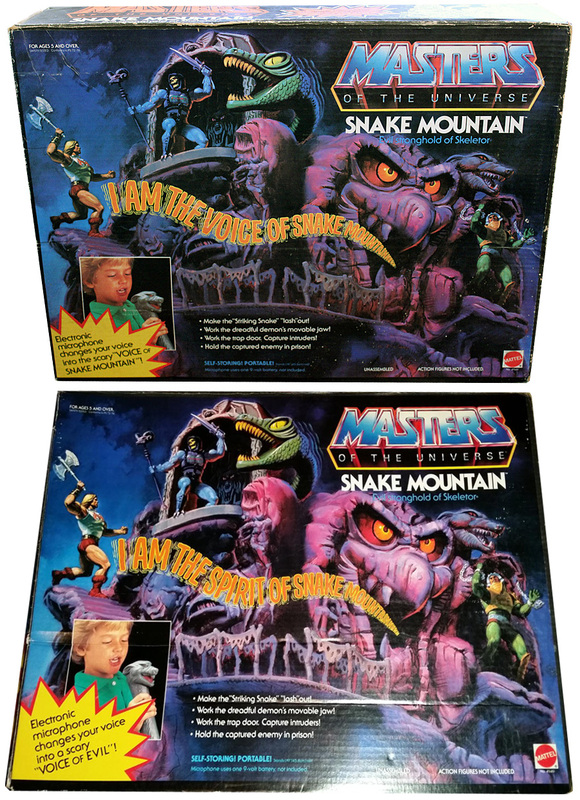 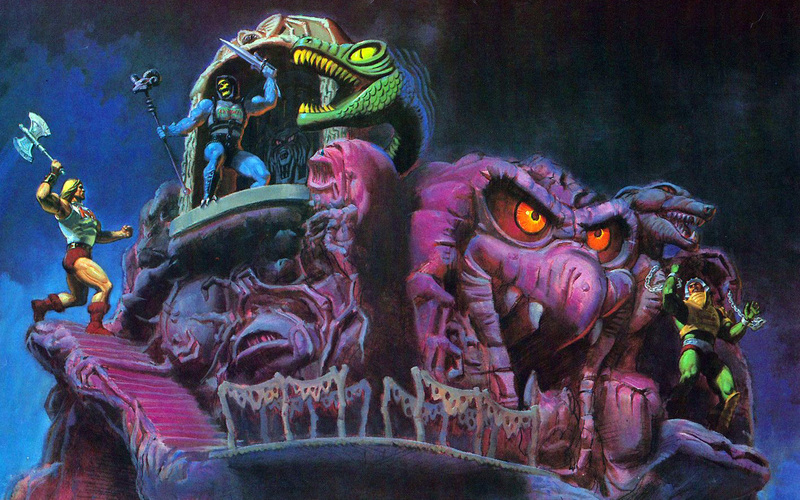 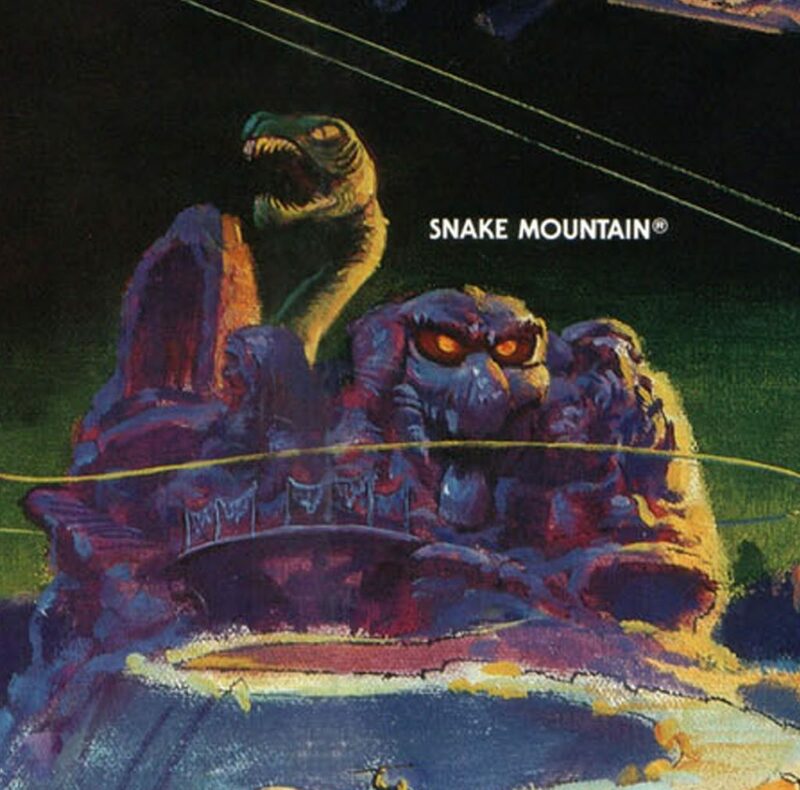 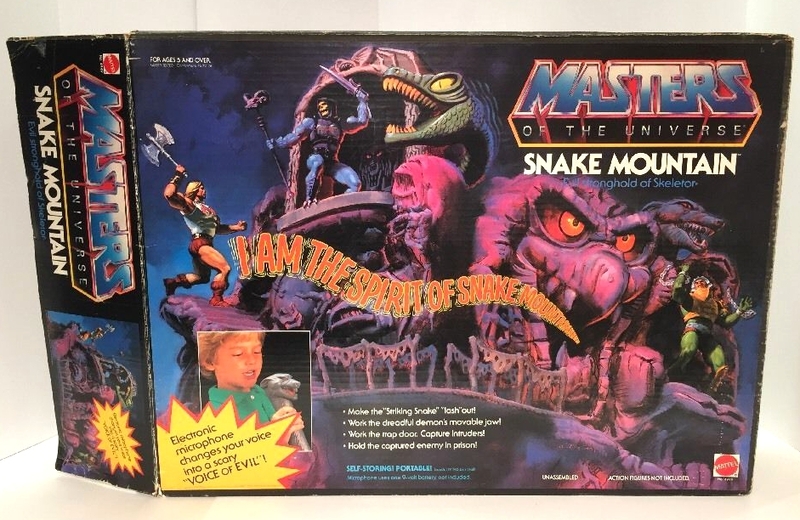 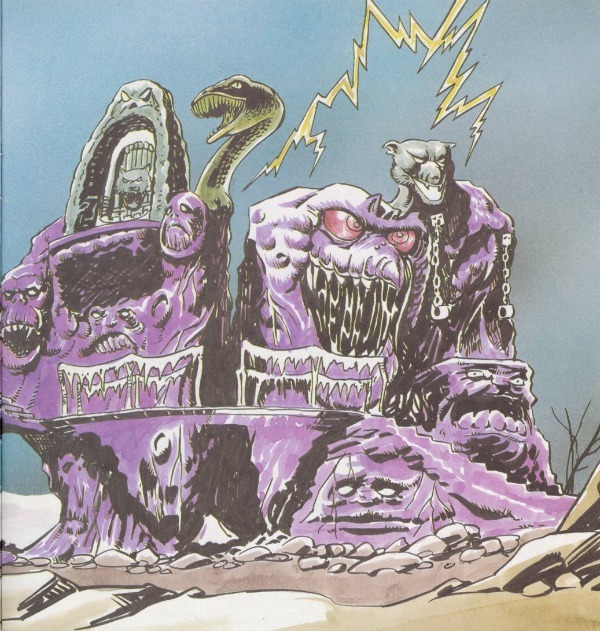 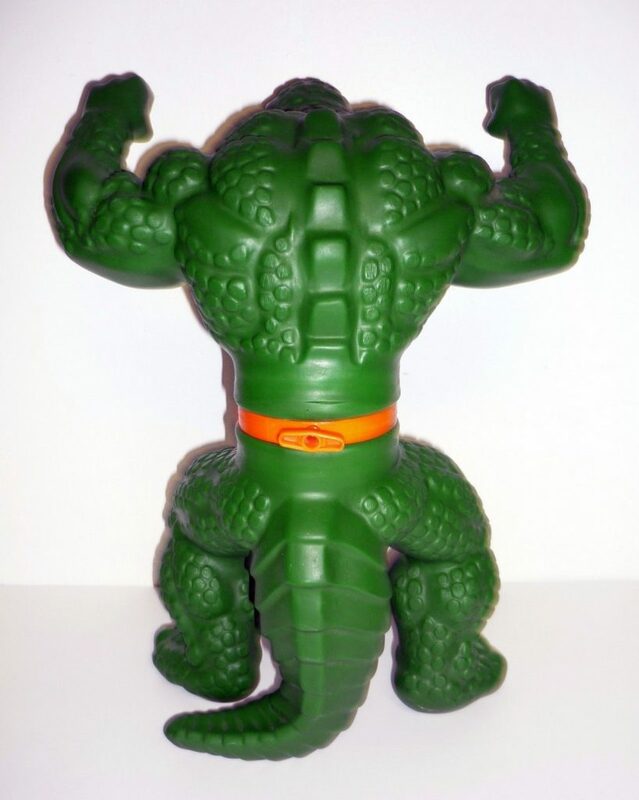 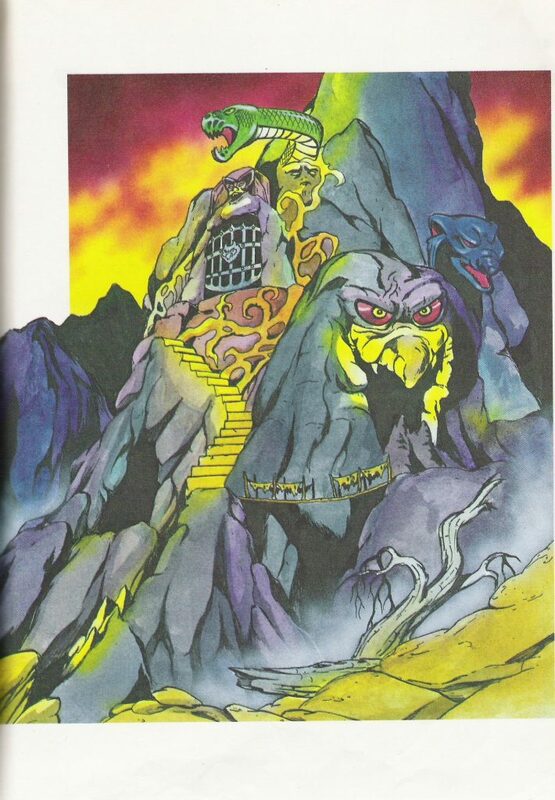 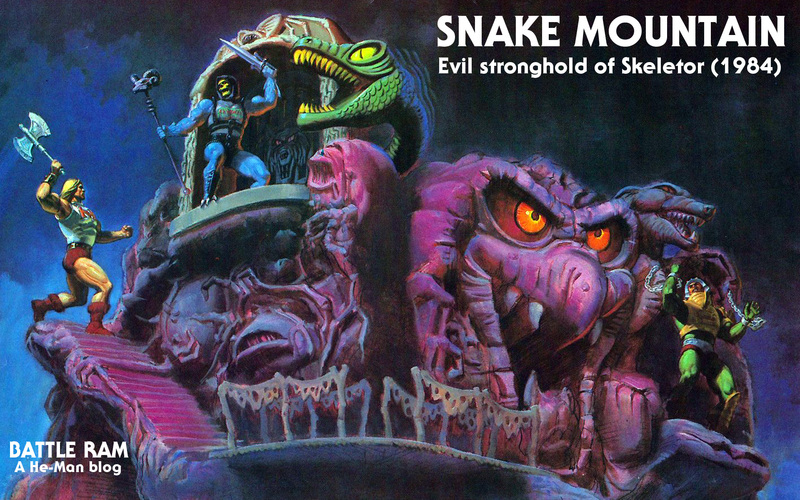 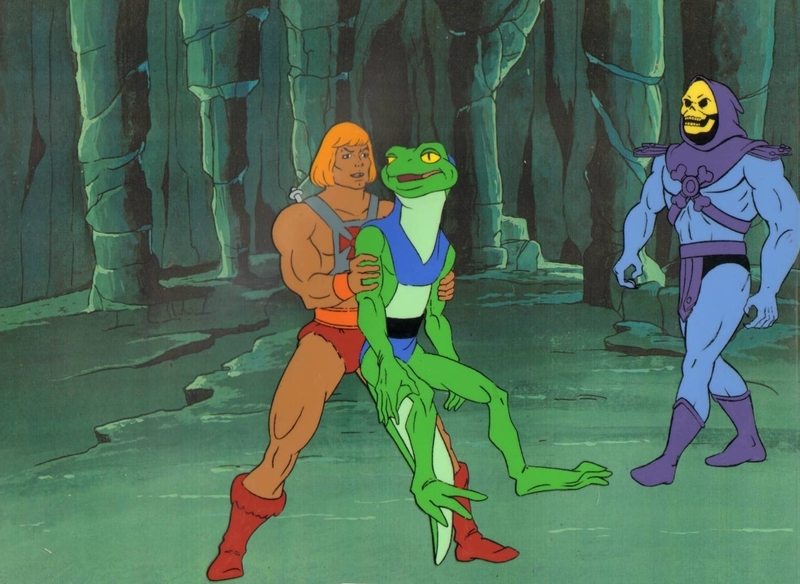 The hand-painted prototype figure, shown below in Mattel’s 1984 dealer catalog, has his final alligator tail design, and sports a purple repaint of the spear that came packed with Castle Grayskull. 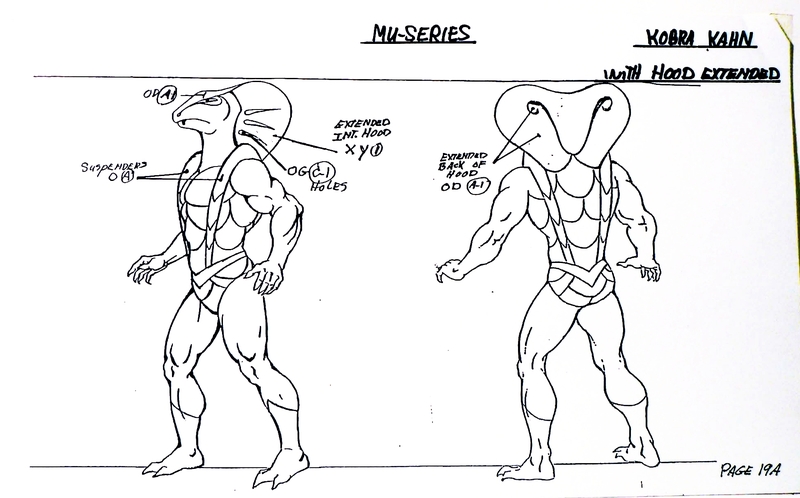 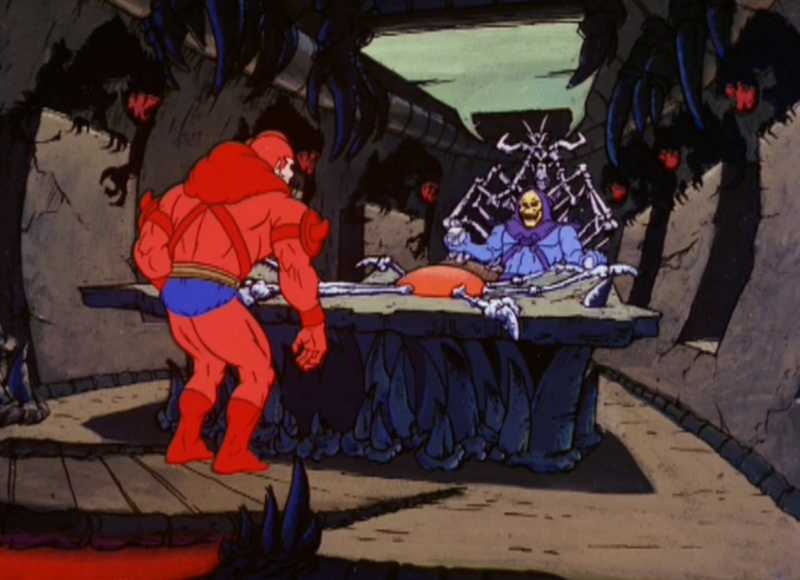 He reuses arms from Skeletor, as well as the legs and torso from Buzz-Off. 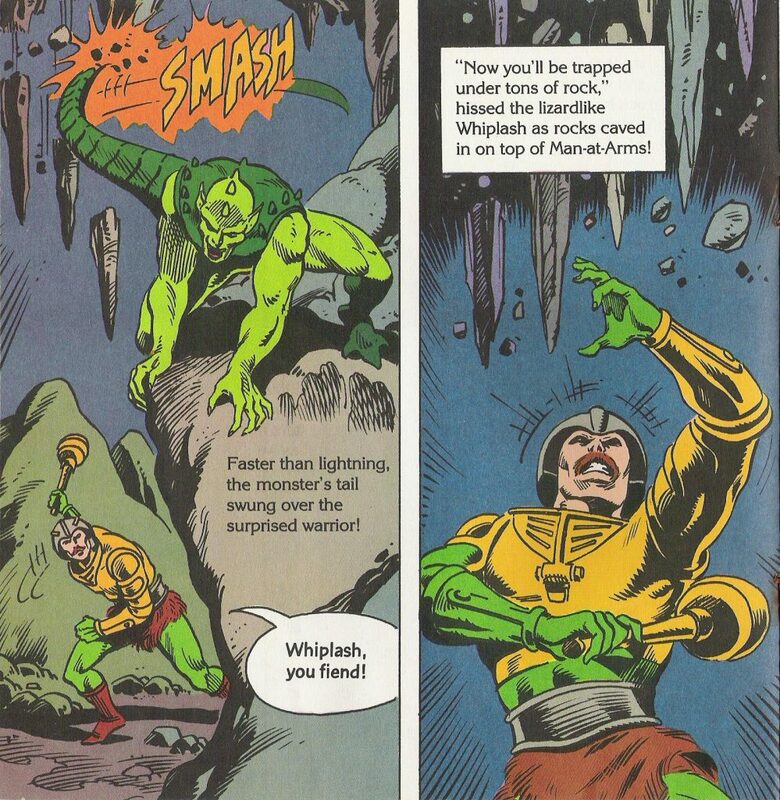 Whiplash’s face is somewhat perplexing. 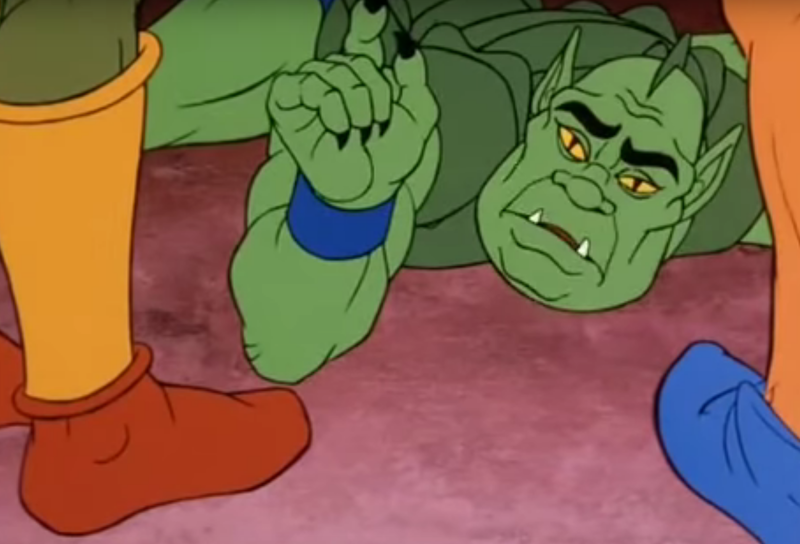 He has two large fangs sticking up out of his lower jaw, but he has a third, downward pointing fang that seems to come from the tip of his nose. 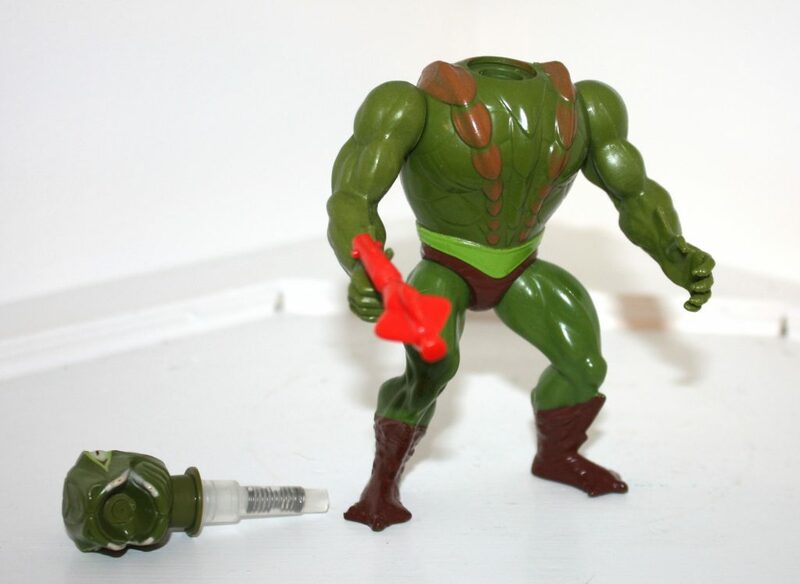 You can also see that where the concept version had very prominent spikes on the top of his head, the final toy has two short nubs on either side of the crest on his head. 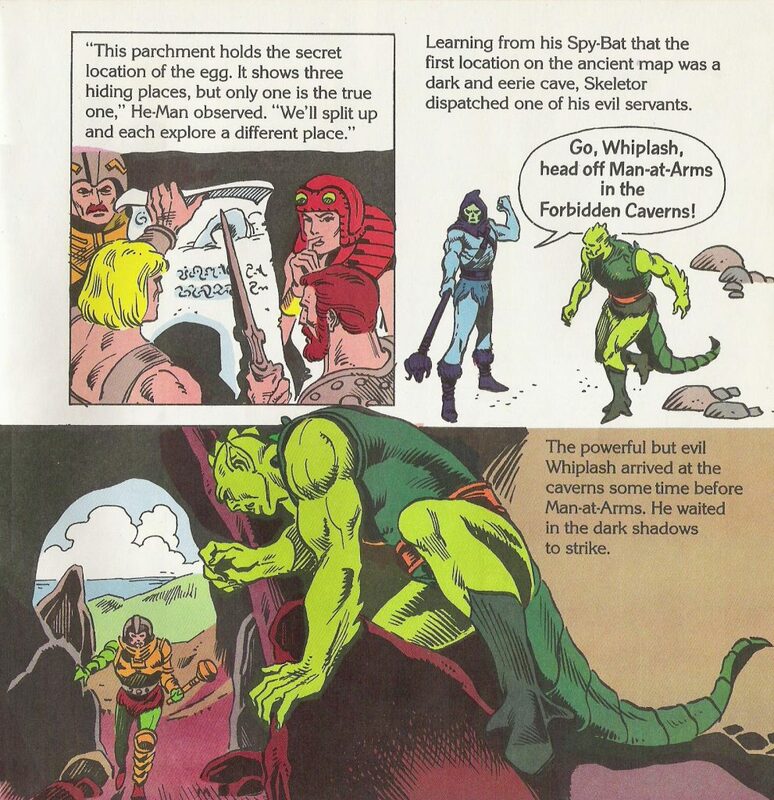 Whiplash makes only two appearances, apart from his debut, in the minicomics. 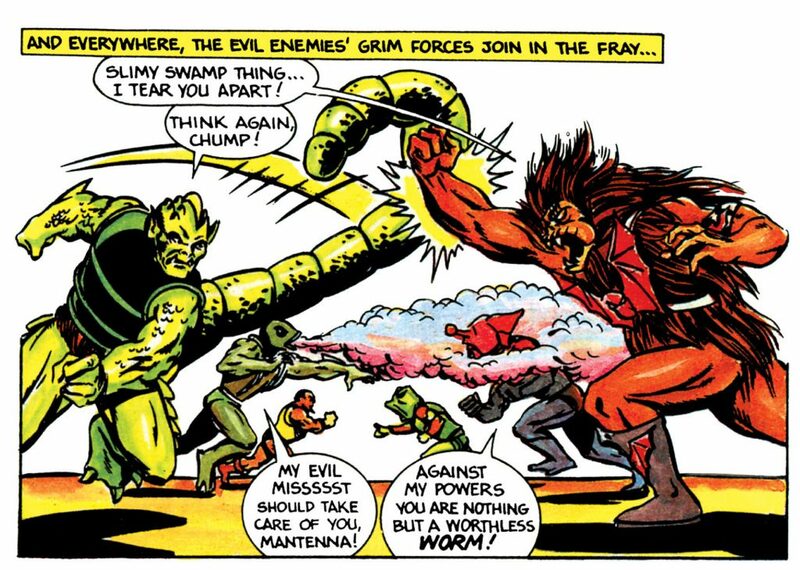 He shows up, confusingly, as a member of the Evil Horde, along with Clawful, Jitsu, Leech and Grizzlor, in Mantenna and the Menace of the Evil Horde! 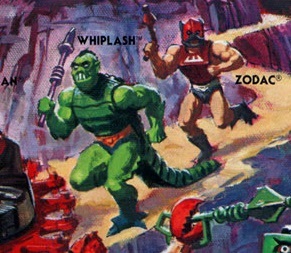 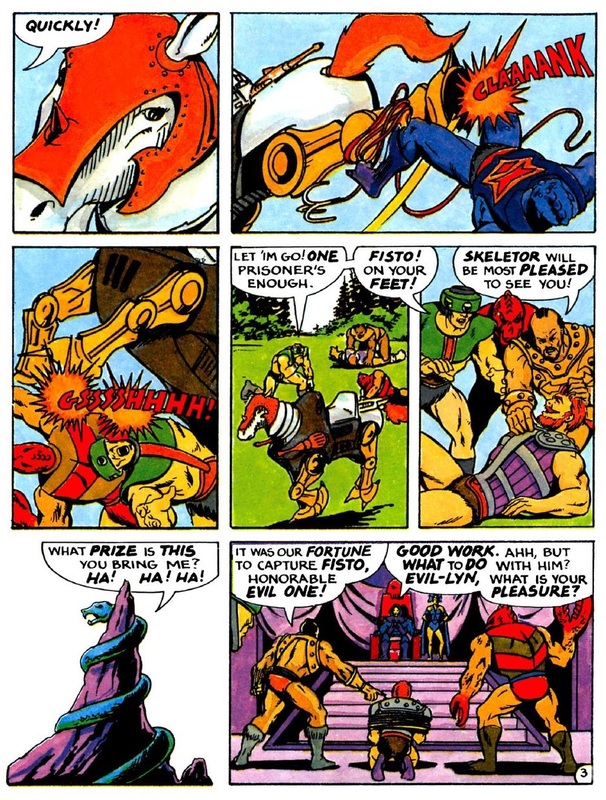 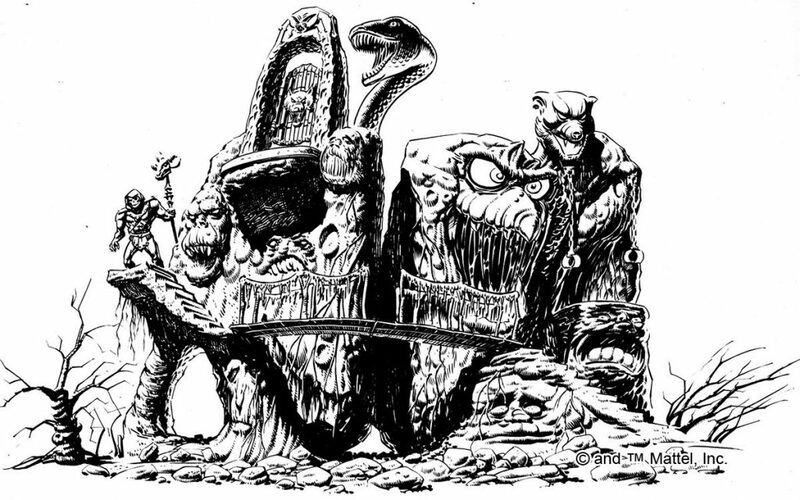 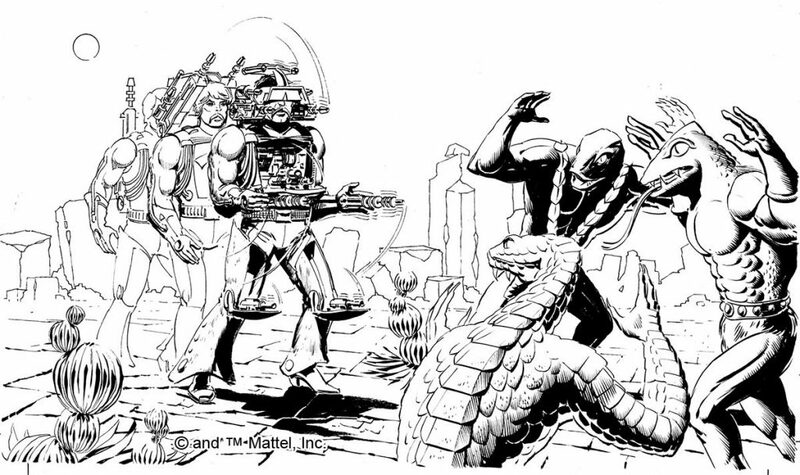 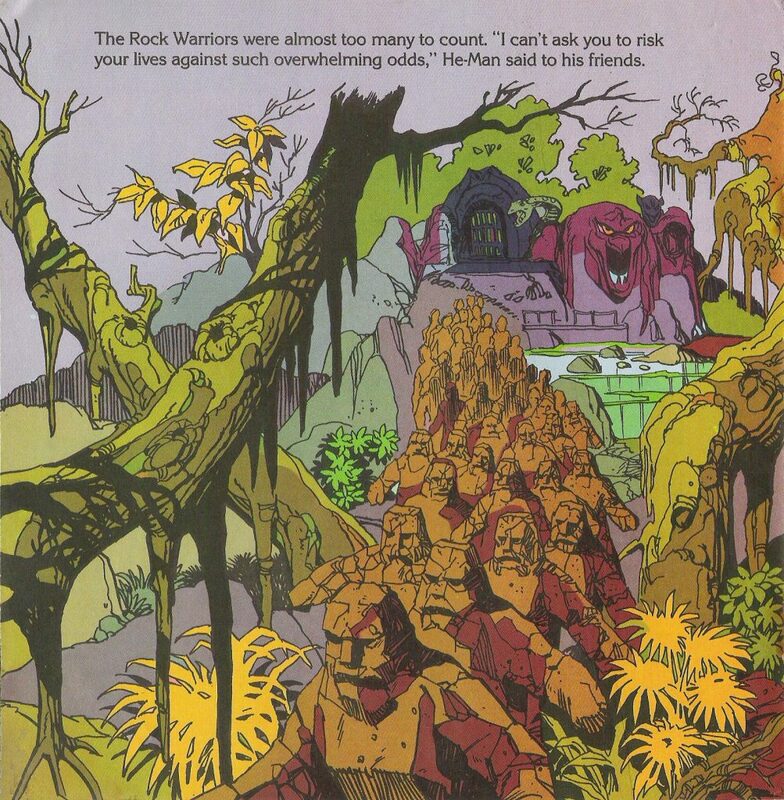 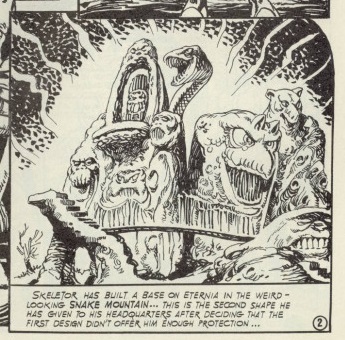 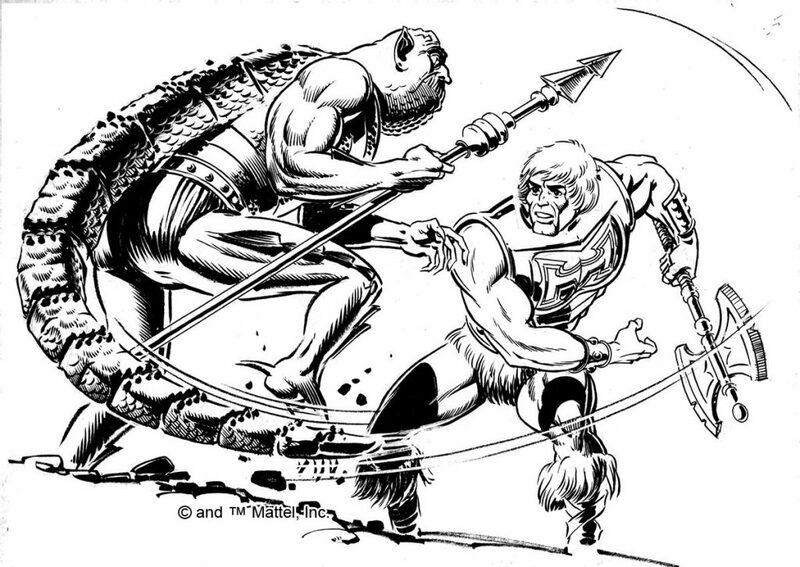 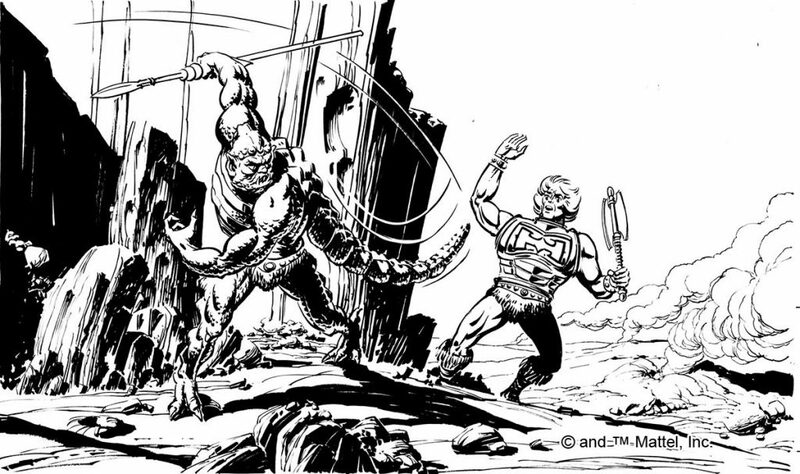 Whiplash is again depicted with spikes around his shoulders in Maze of Doom, illustrated by Al McWilliams. 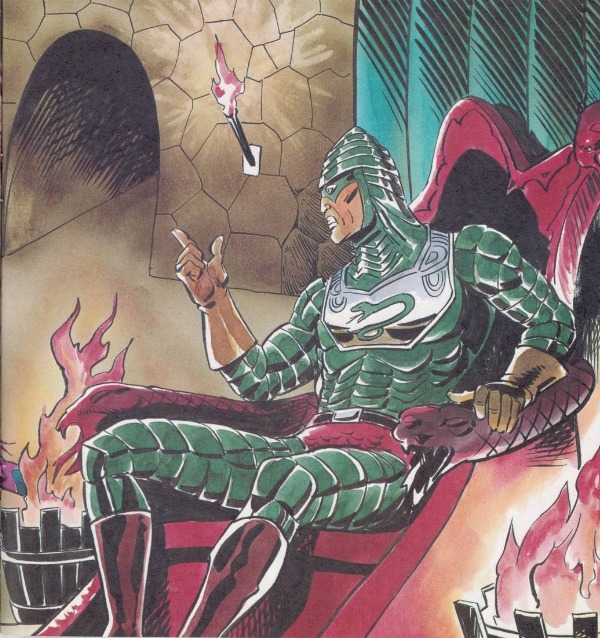 It seems likely he used Barreto’s art as a reference for the character. 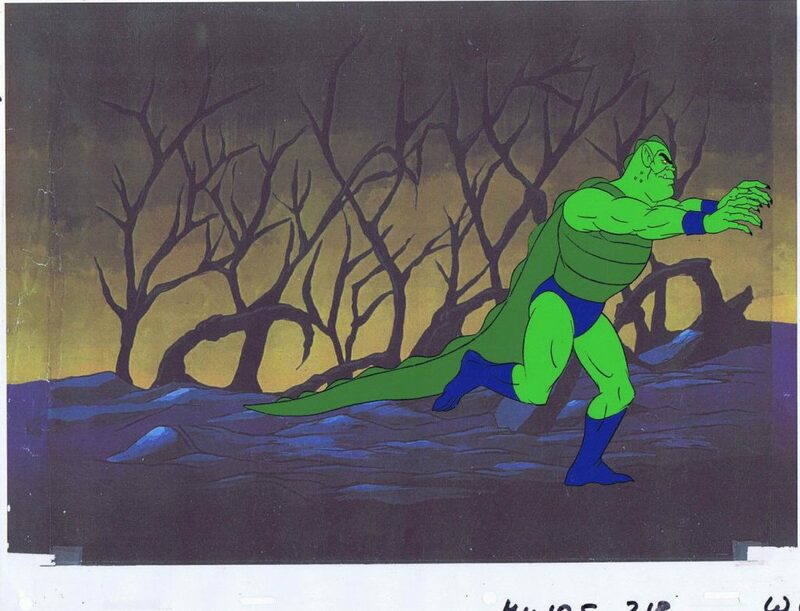 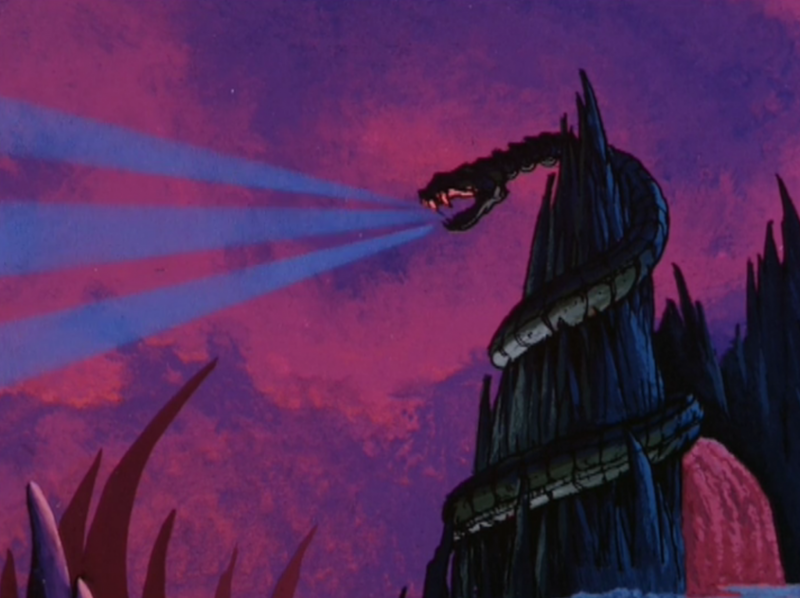 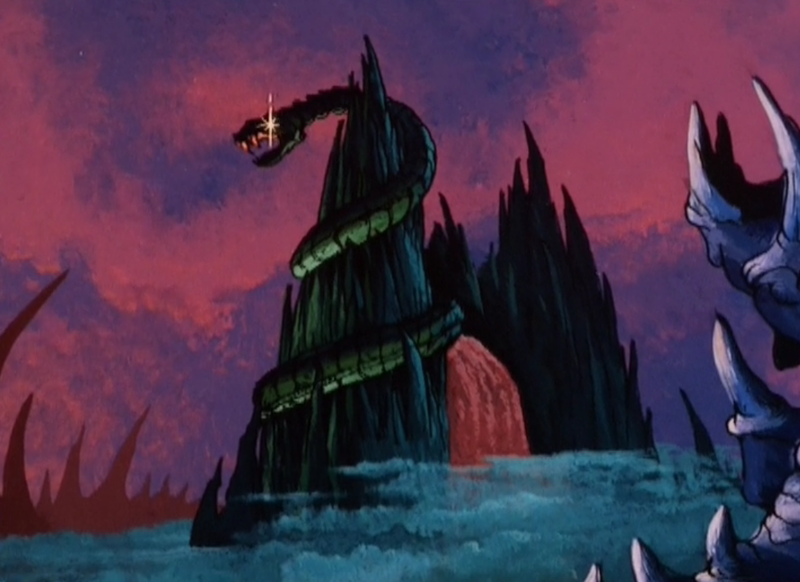 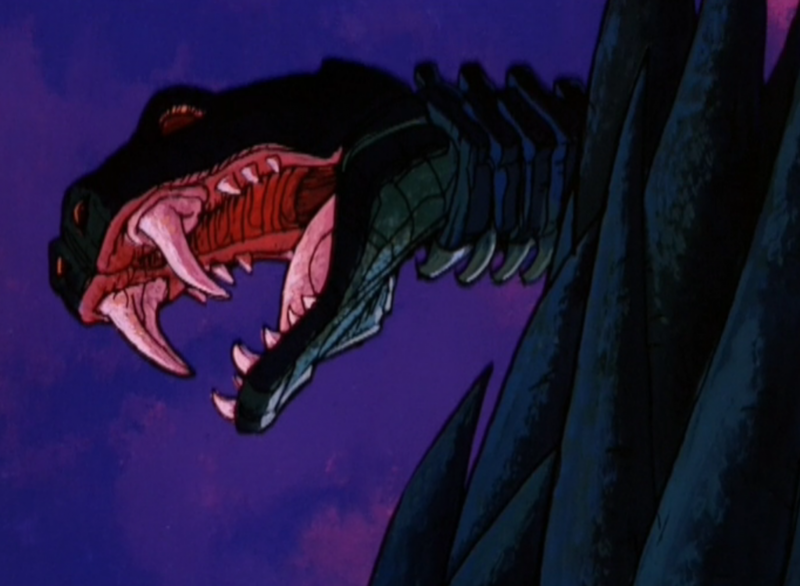 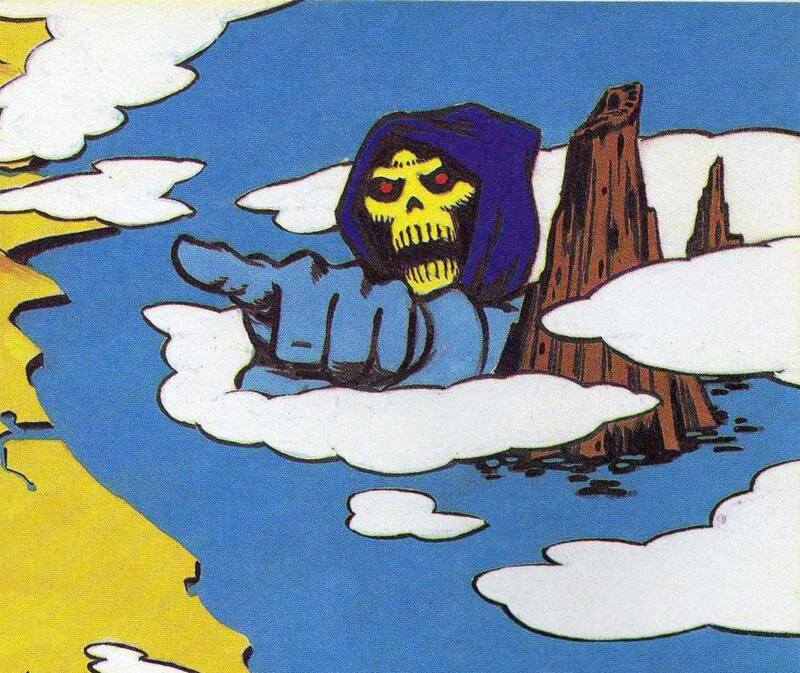 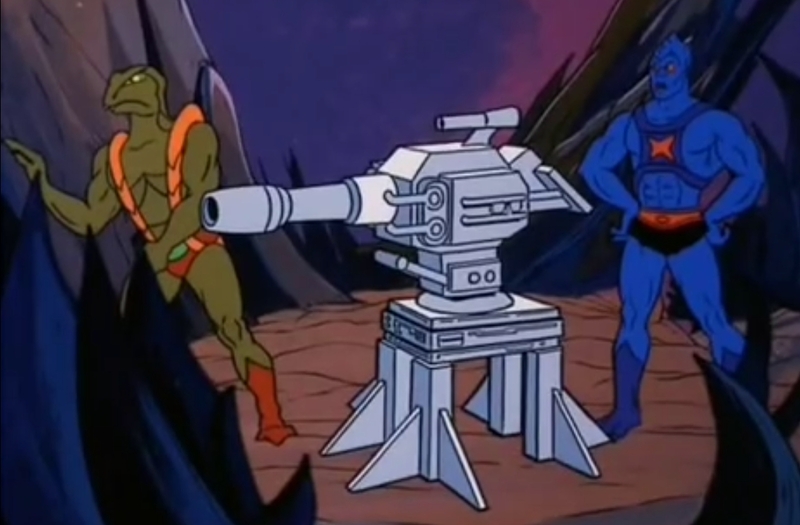 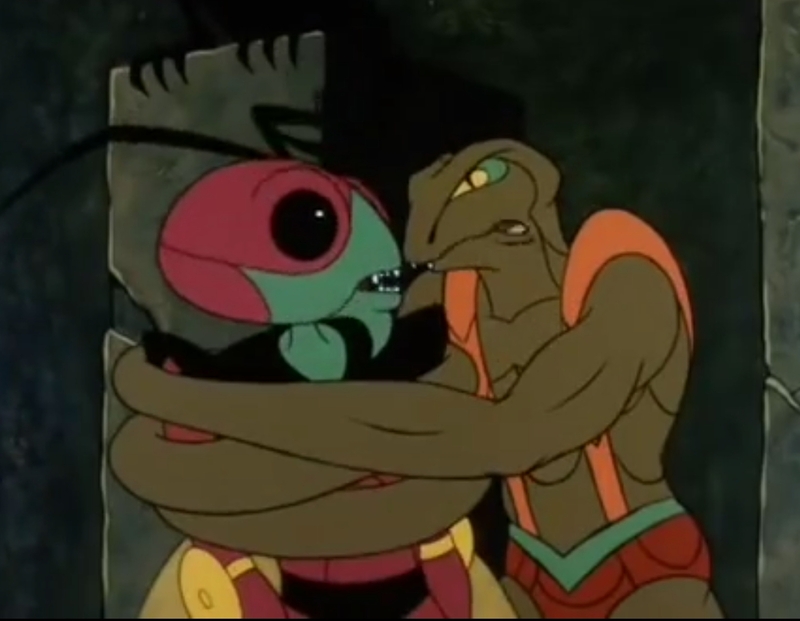 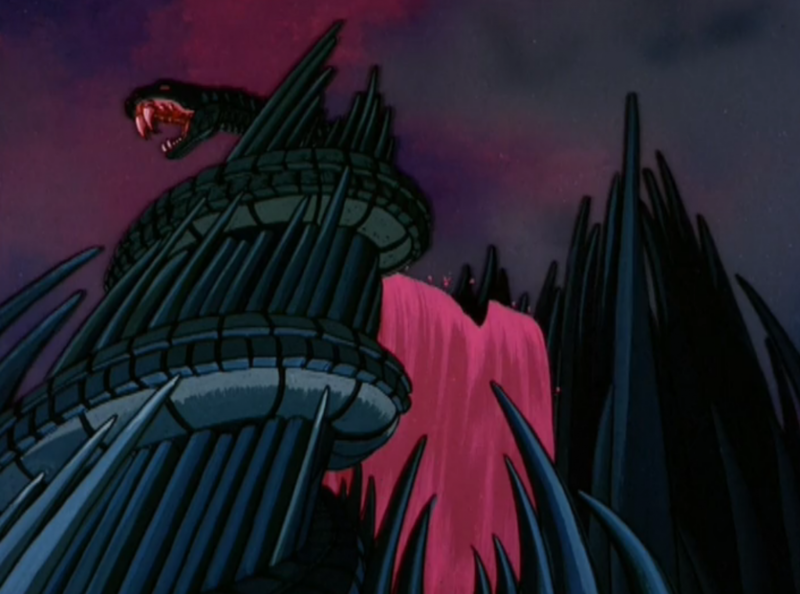 Filmation’s He-Man cartoon usually depicted Whiplash as one of Skeletor’s more competent Henchmen. 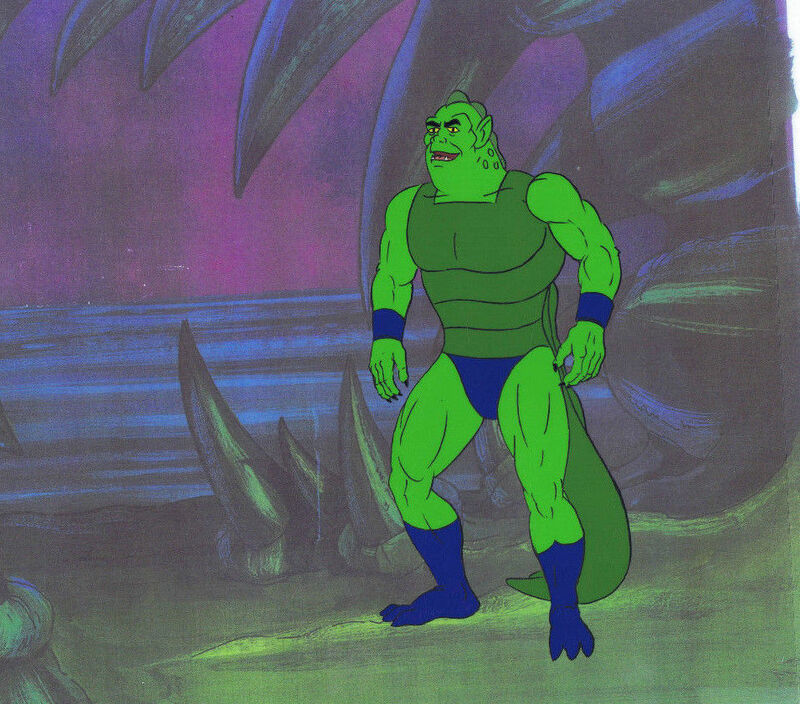 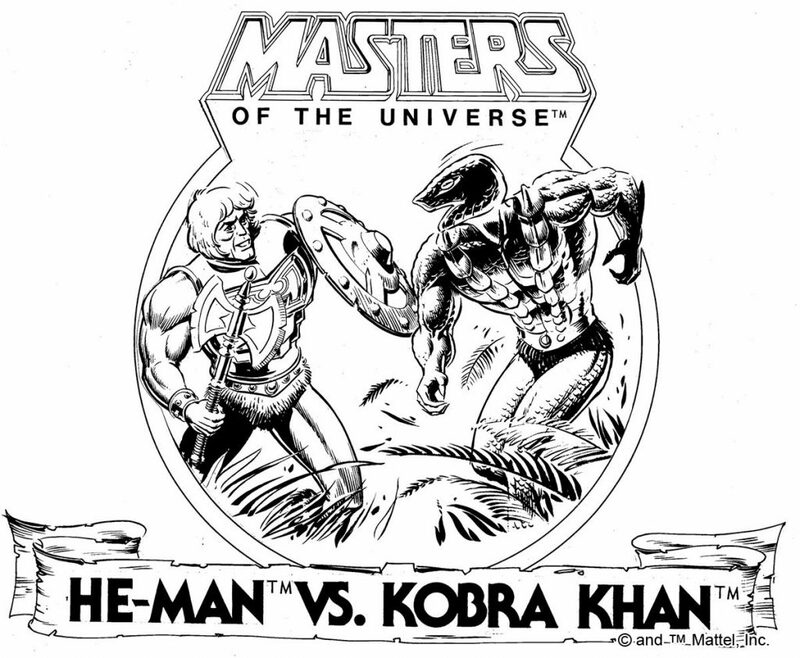 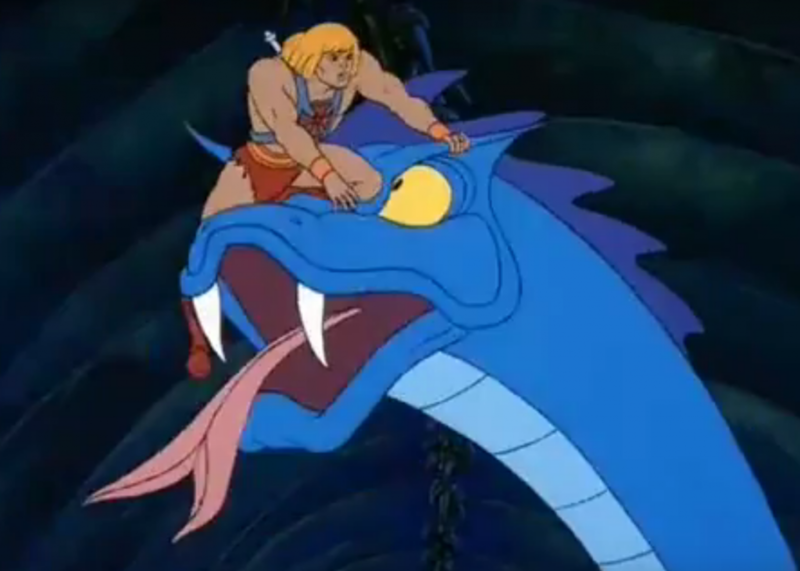 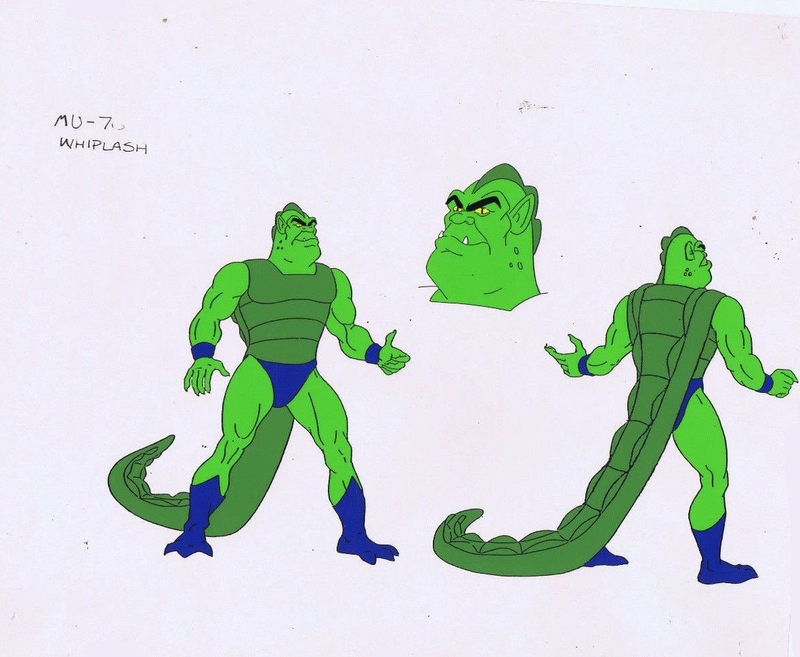 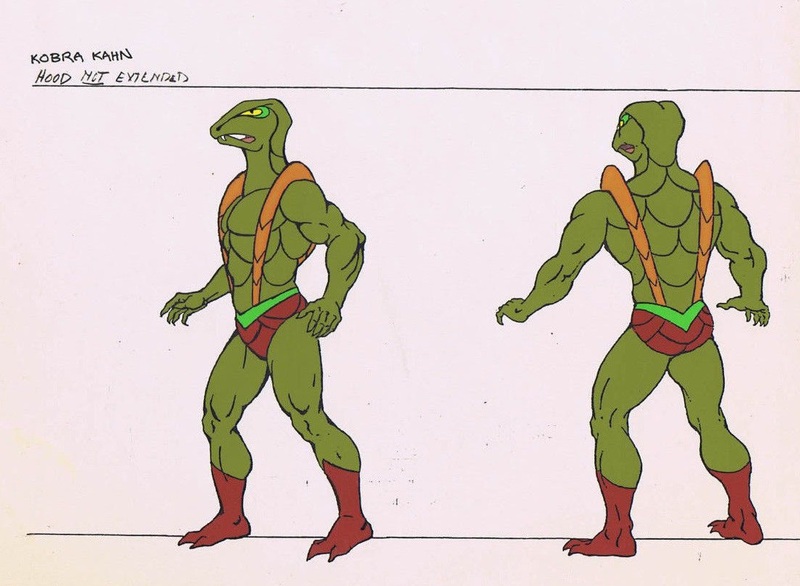 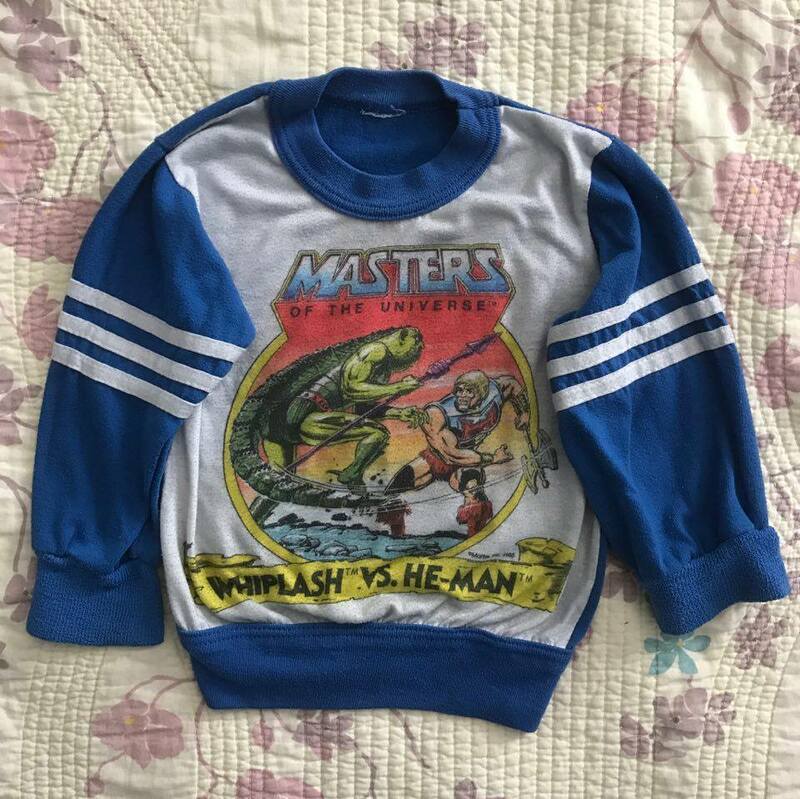 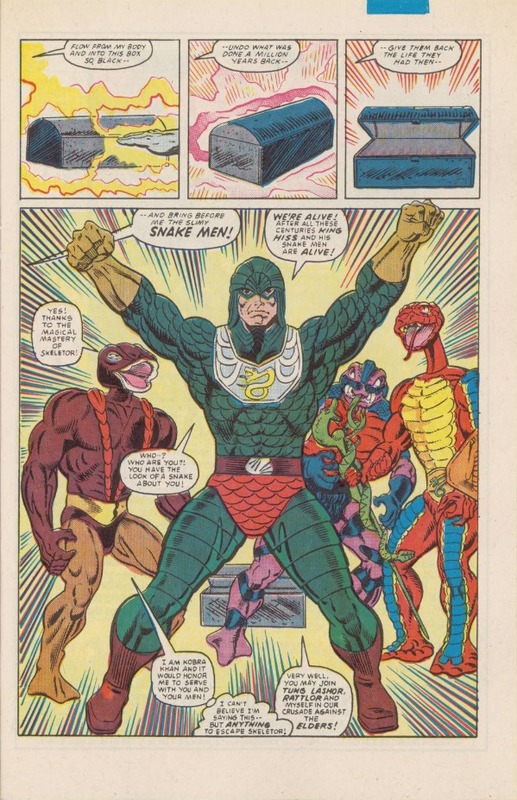 Design-wise, the animated version of the character is more or less a simplified version of the action figure, but with Mer-Man-like feet, blue wrist bracers, and no orange belt. 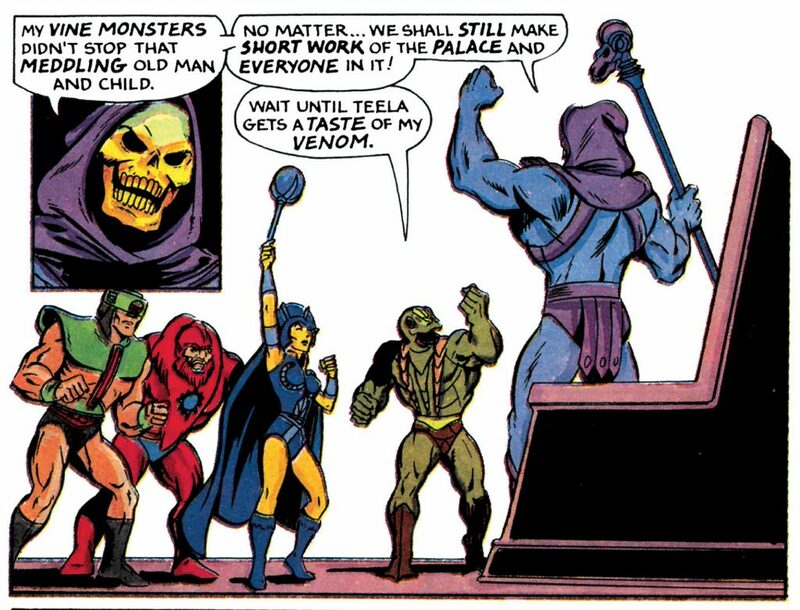 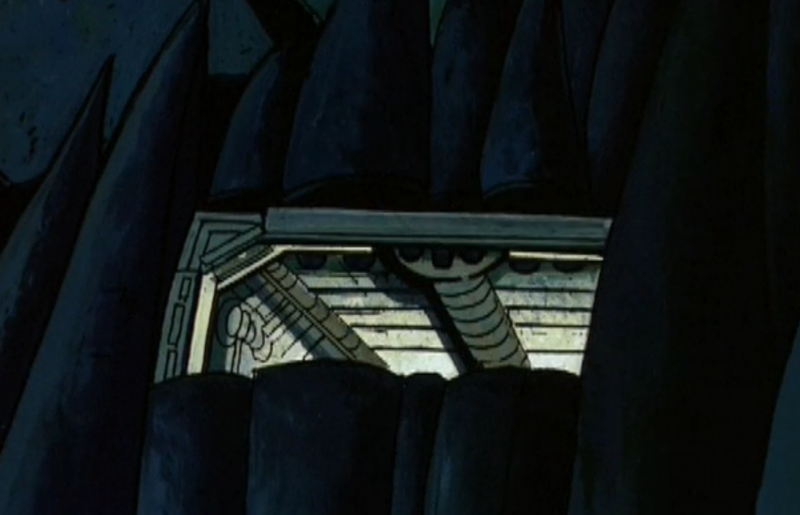 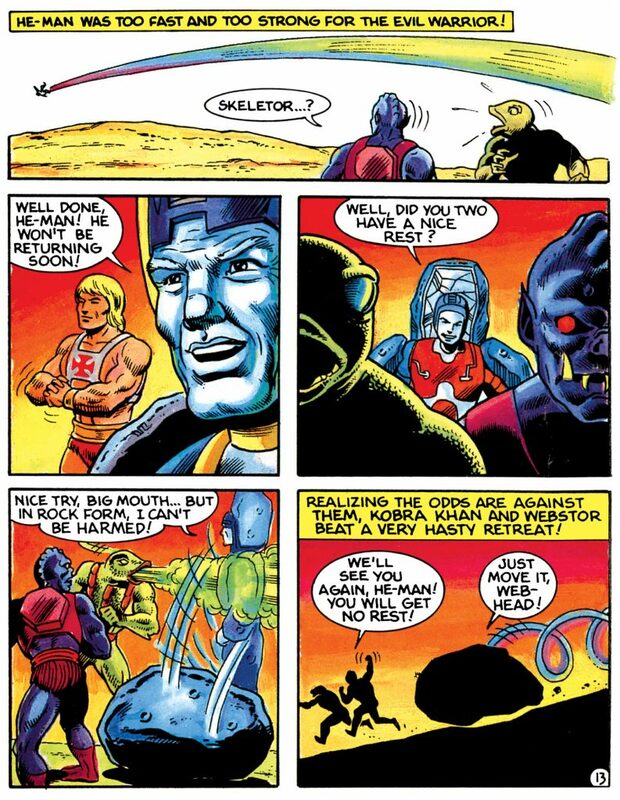 One of my favorite episodes where Whiplash plays a prominent role is “To Save Skeletor”. 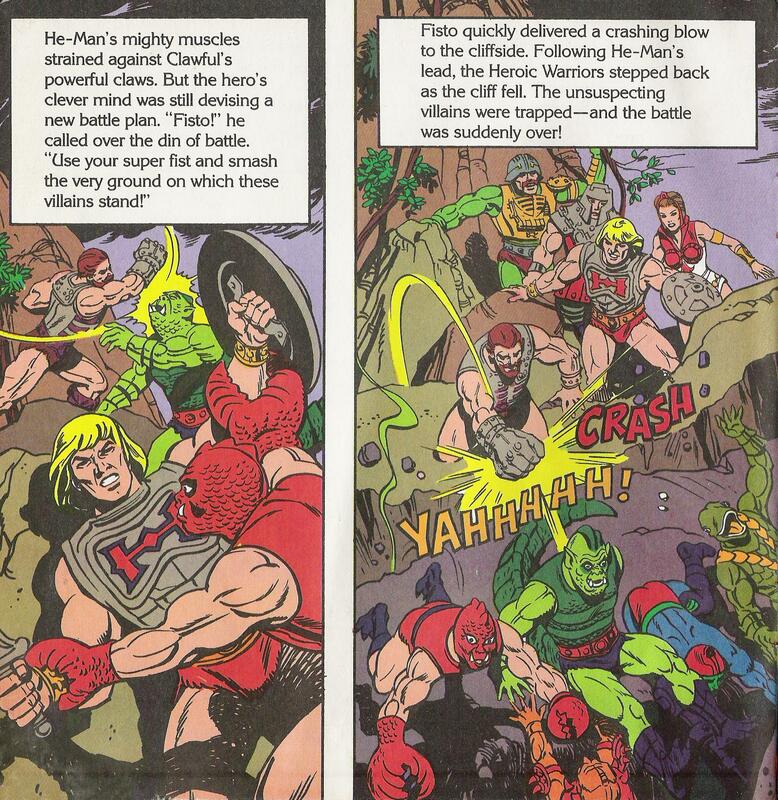 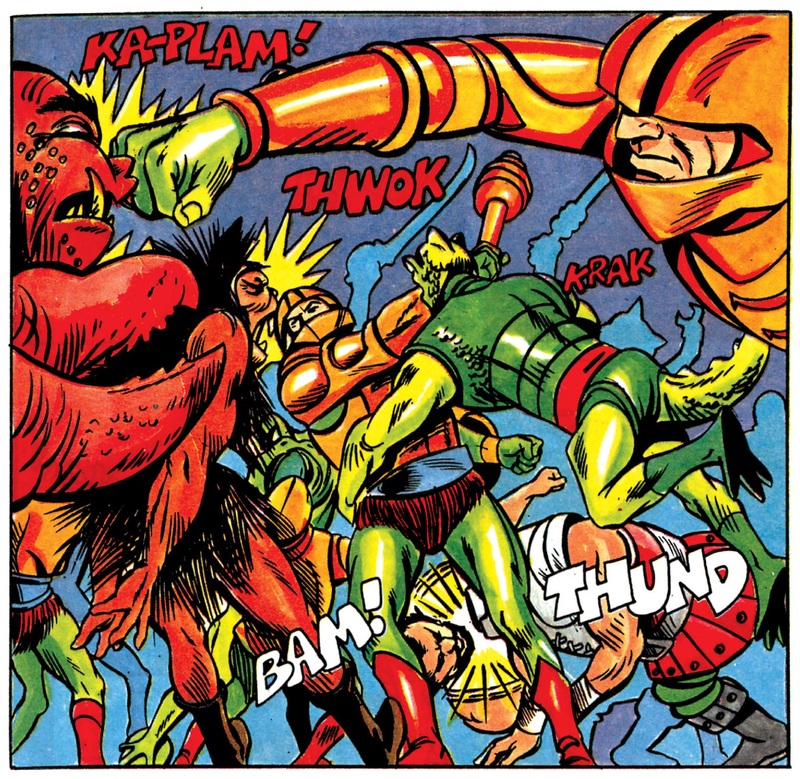 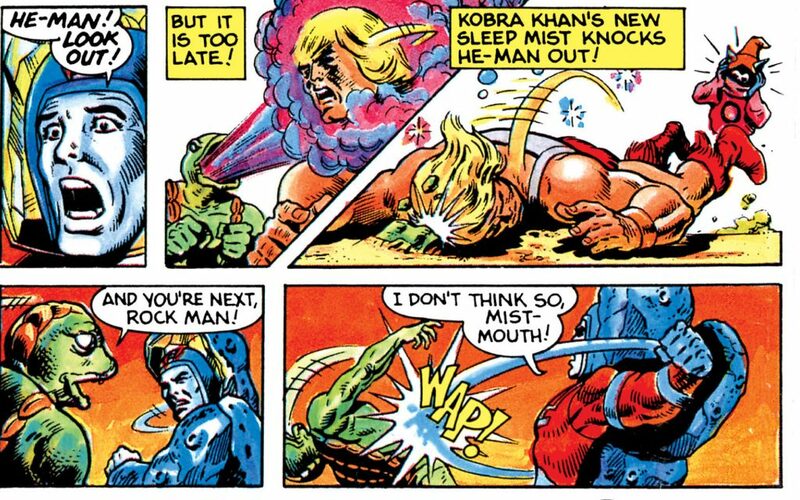 In the story, Whiplash arrives half-dead at the royal palace, pleading for help from the heroic warriors. 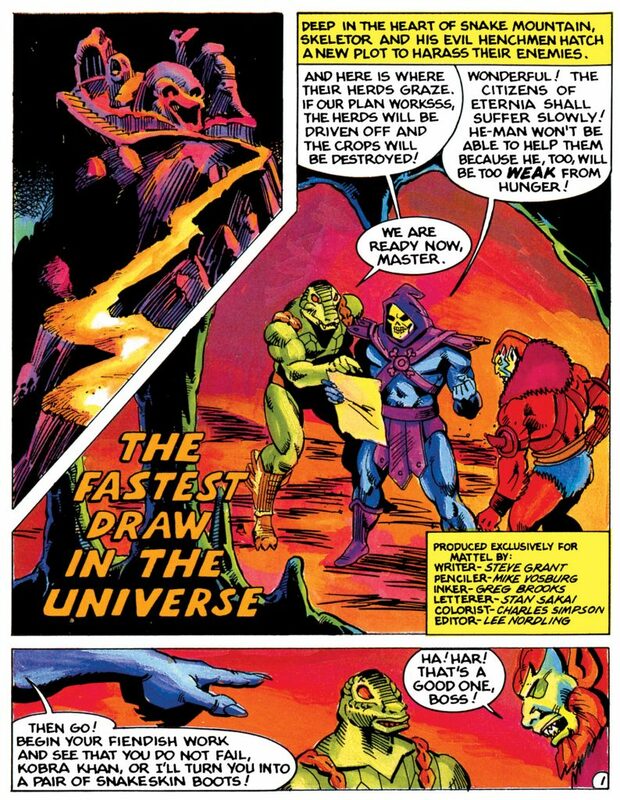 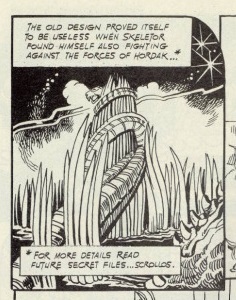 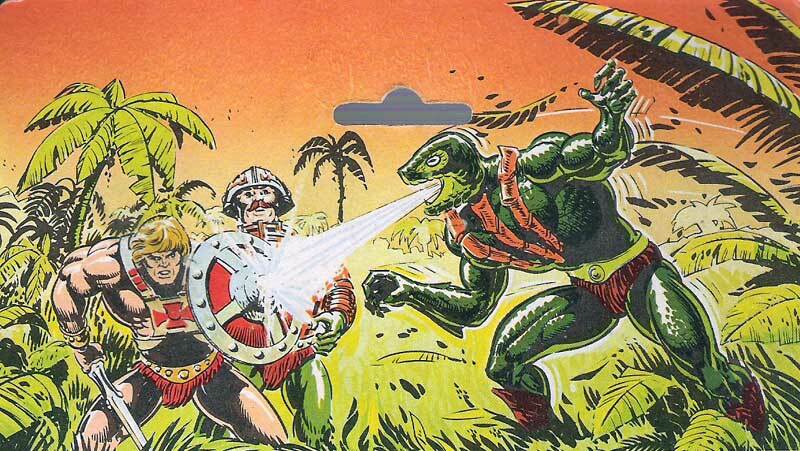 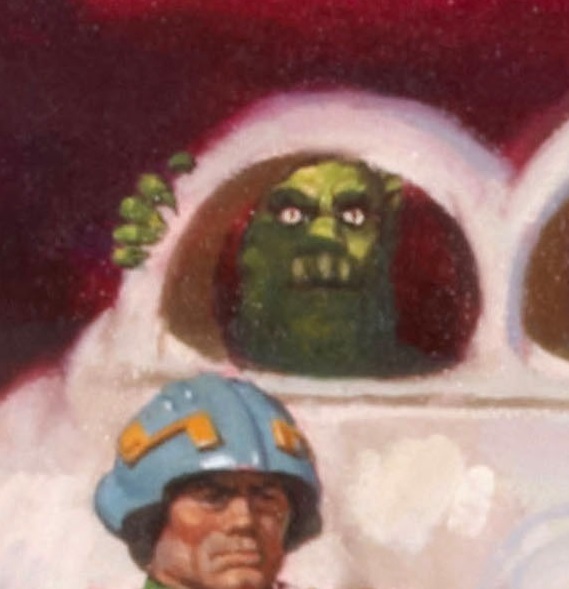 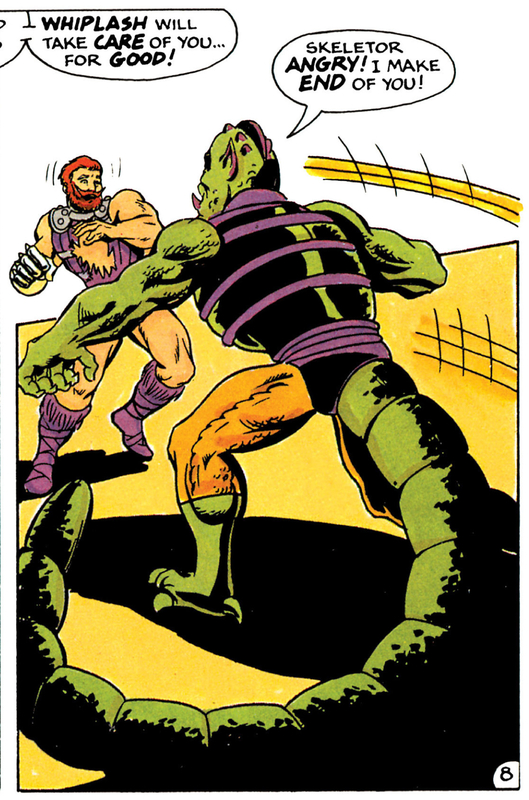 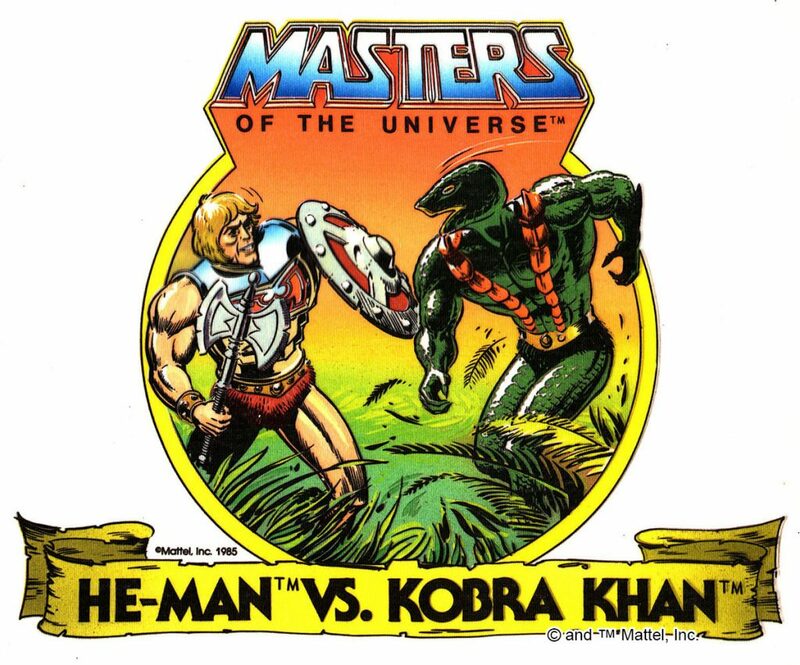 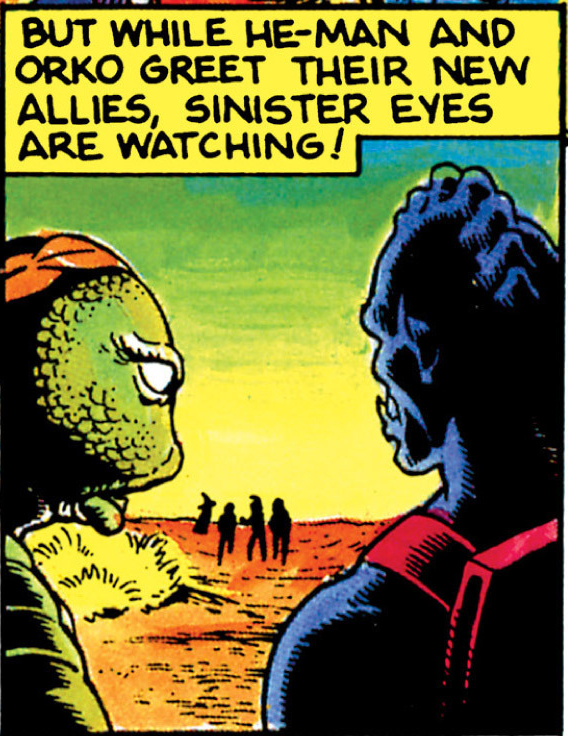 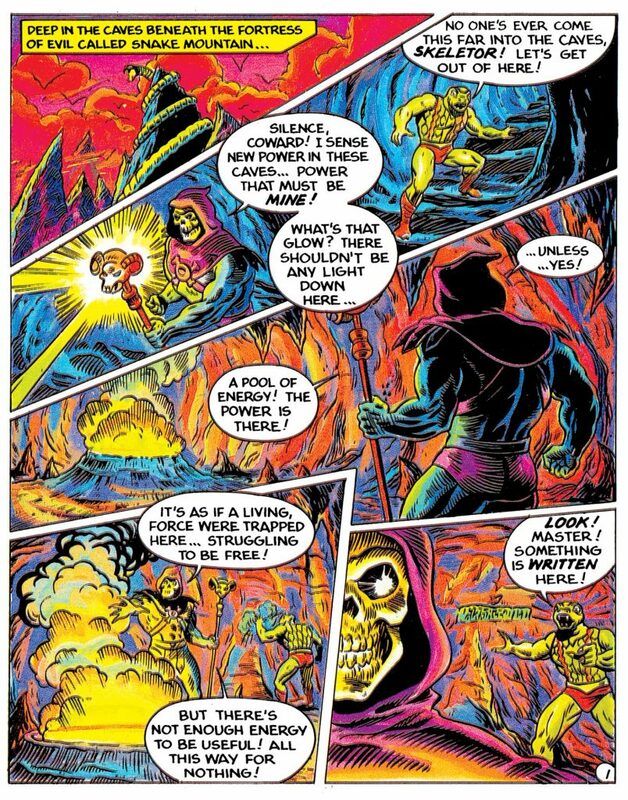 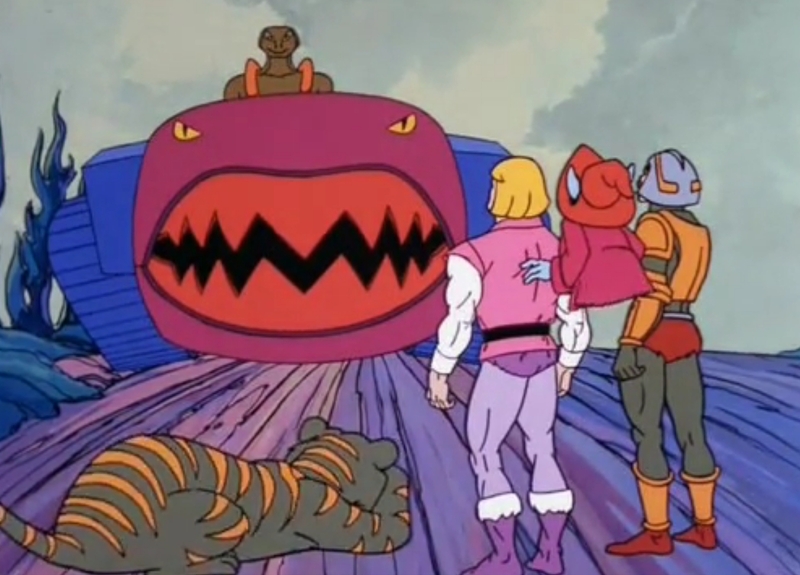 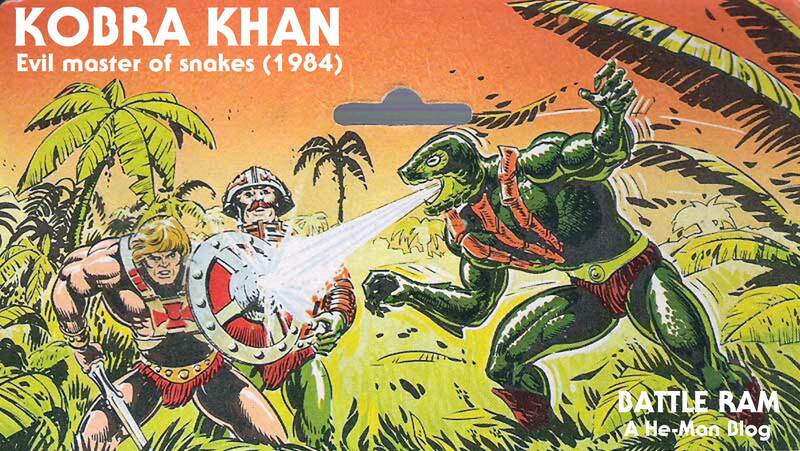 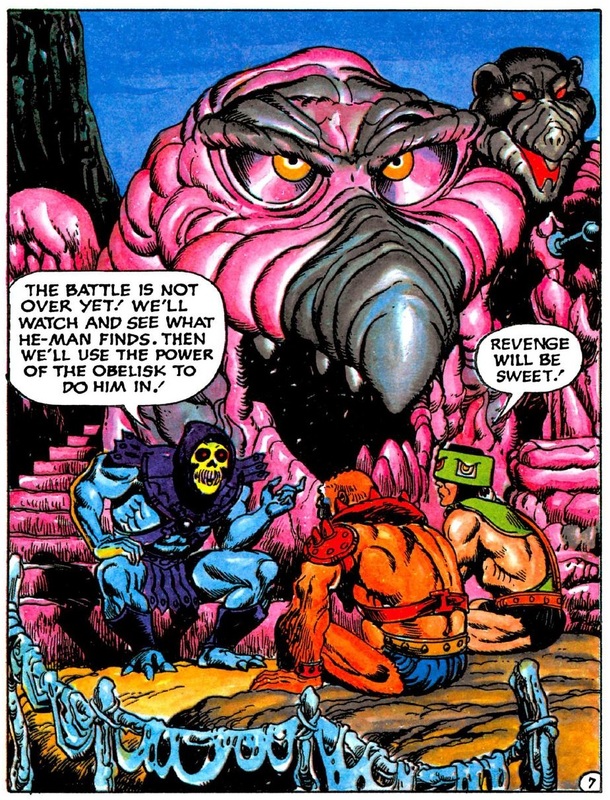 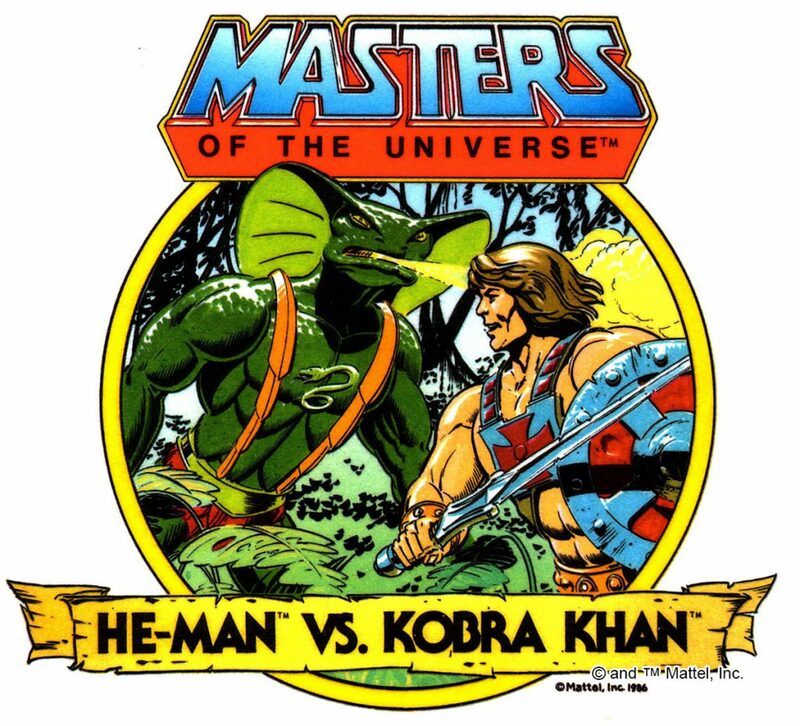 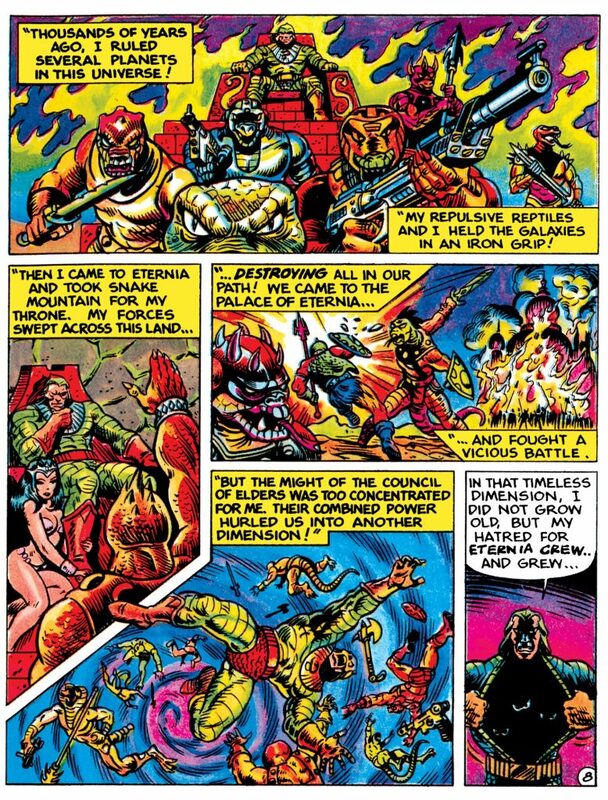 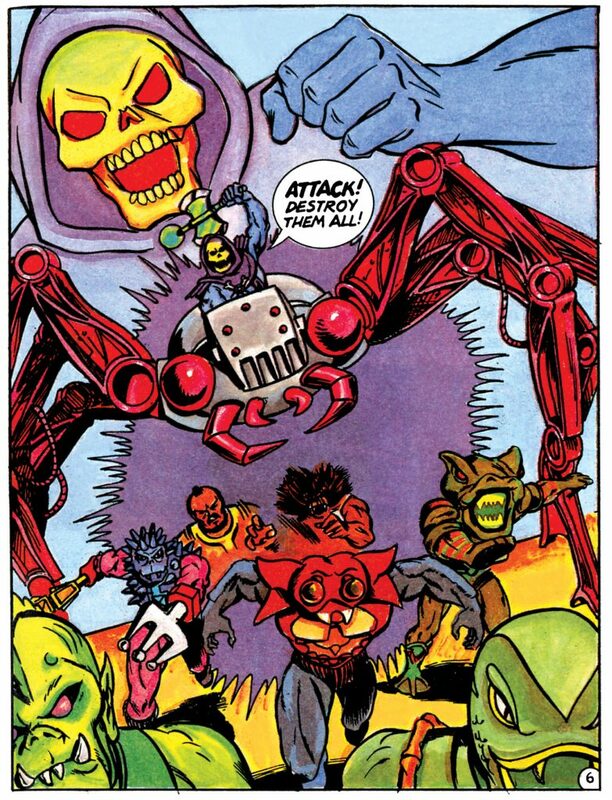 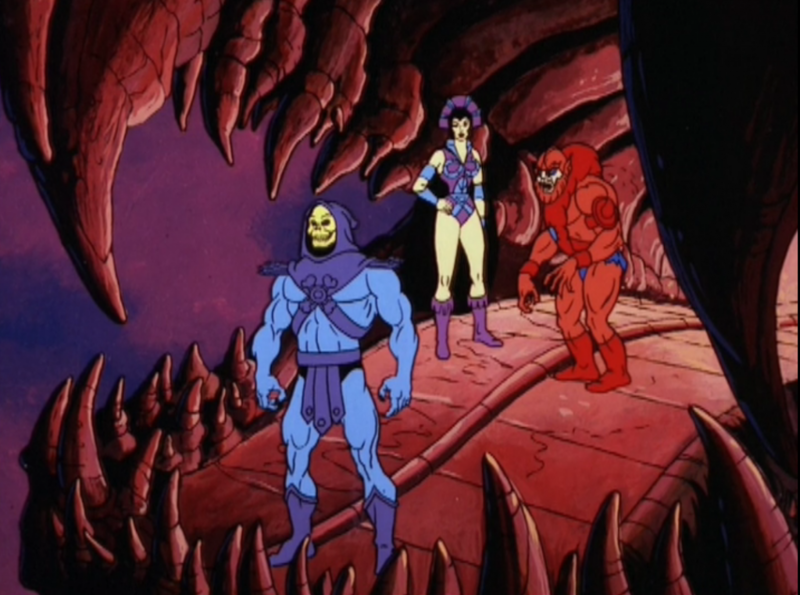 As it turns out, Skeletor had summoned an extra-dimensional being named Sh’Gora with the intent of using him to take over Eternia, but the creature had quickly overpowered the evil warriors and was threatening to destroy the planet.